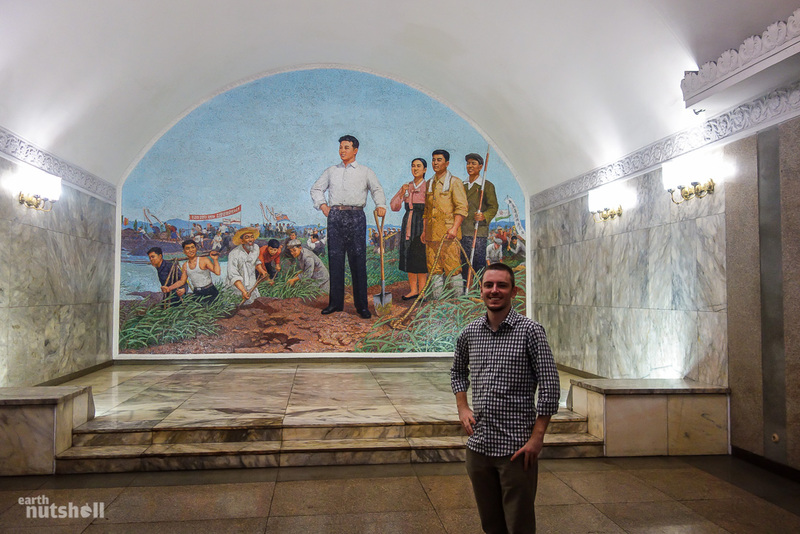 In a Nutshell: I was part of the first ever group of foreigners given access to all stations across both lines of the Pyongyang Metro. 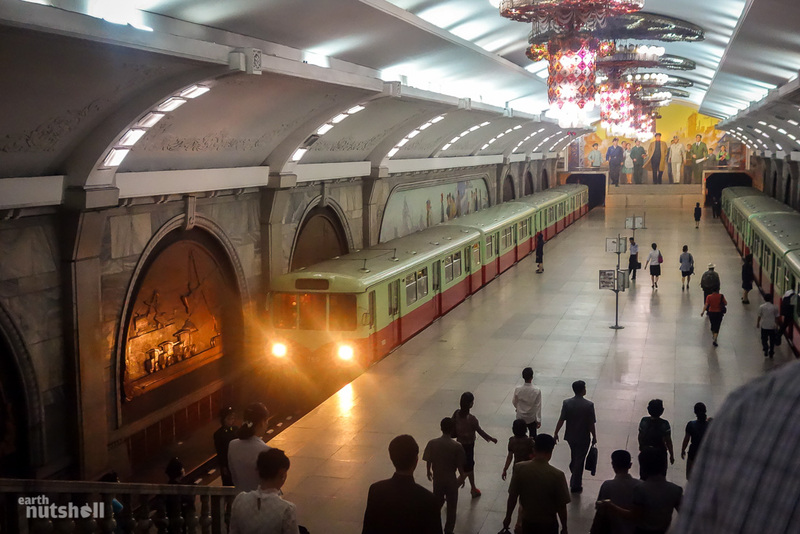 This may sound mundane, but the restricted Pyongyang Metro is surely among the most mysterious yet beautiful transit systems on earth. 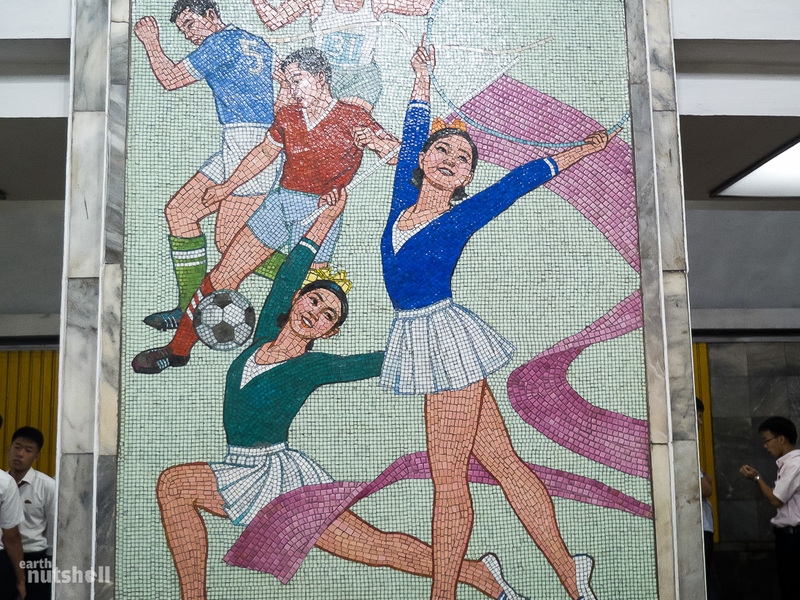 Each of its sixteen stations are unique yet ultra-nationalistic in theme, showcasing North Korea’s revolutionary history, goals and achievements to impressionable commuters through a series of mosaics, murals and monuments. 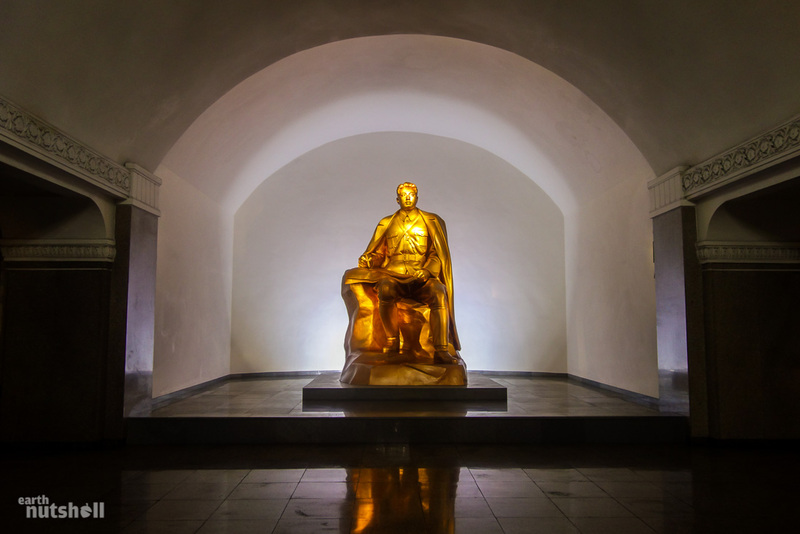 It’s a lavish underground museum long shrouded by foreign conspiracy theory. 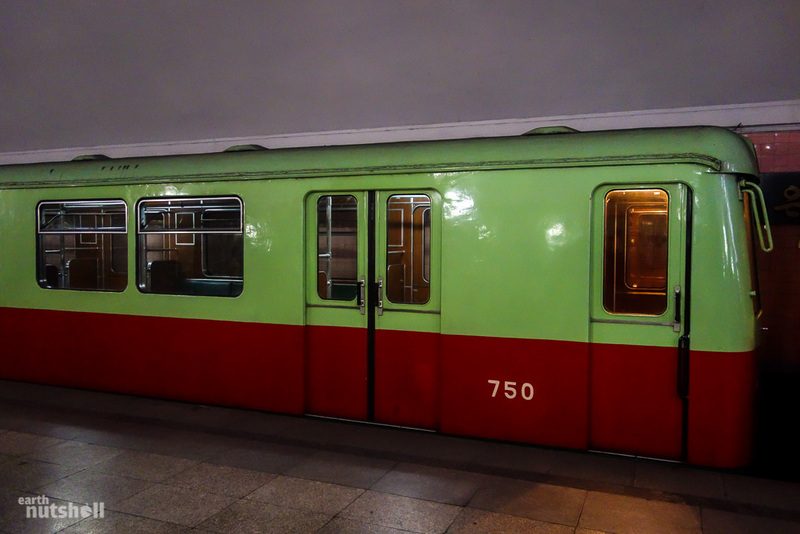 Sensationalism aside, here is my journey in over sixty photos of the beating heart of Pyongyang, the Pyongyang Metro. 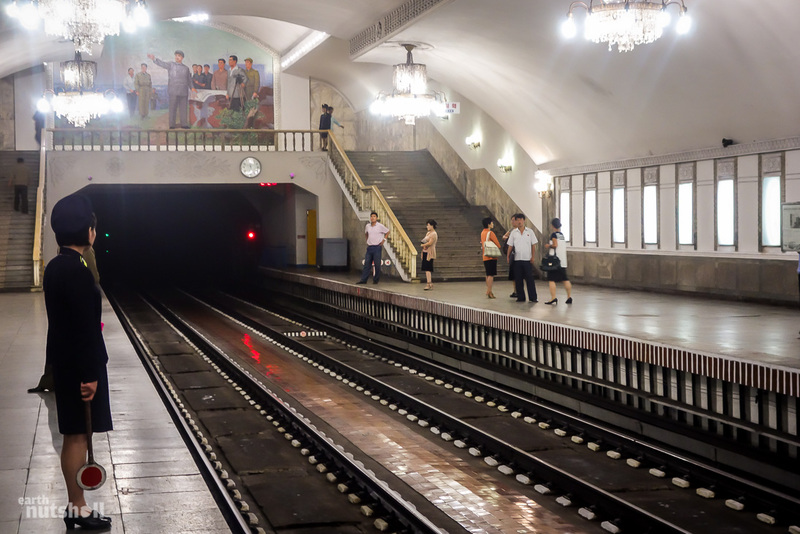 The Pyongyang Metro is the deepest metro system in the world at 110 metres and it conveniently doubles as a nuclear bunker. It’s an almost four-minute descent to reach the train platforms and the hallways are protected by thick steel blast doors. You can see these most notably at Yonggwang and Kaeson stations. This is Puhung Station, the terminus of the Chollima line. Prior to 2010, Puhung was one of just two metro stations that foreign visitors were permitted to visit, even with mandatory guides. The other is Yonggwang Station and it’s just one stop ahead. Both stations were the final two to be completed and are regarded as the most lavish, likely the reason they’re chosen as the showcase stations on tourism itineraries. 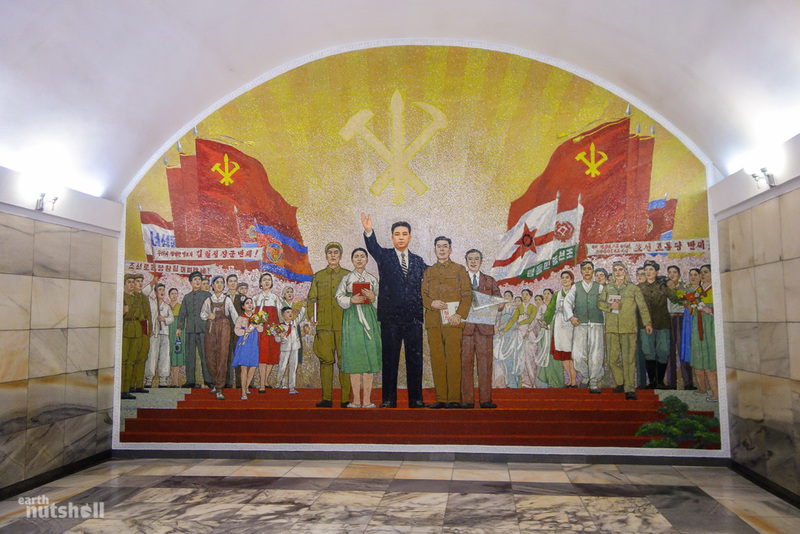 The mural to the back is entitled ‘The Great Leader Kim Il-Sung Among Workers’. Centrepiece mosaics adorn every station and each fit a unique theme. This, of course, is in addition to the overarching theme of President Kim Il-Sung. 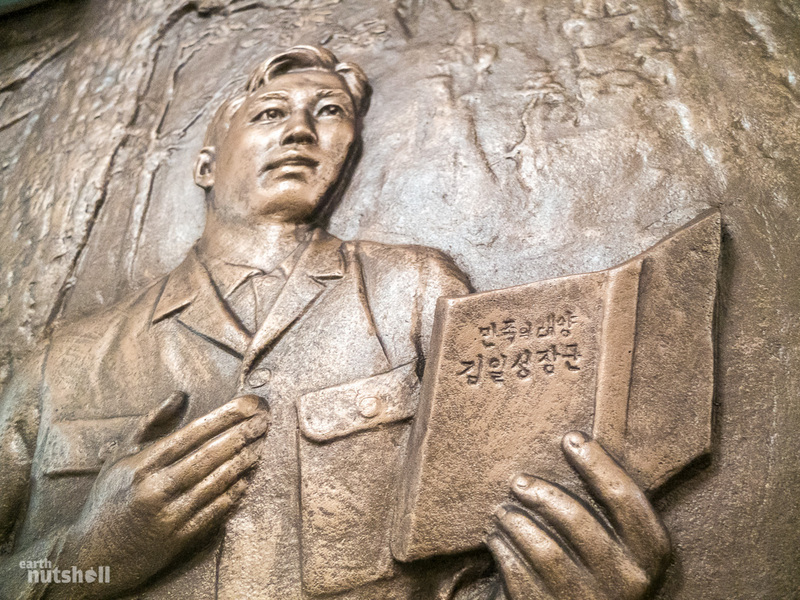 President Kim Il-Sung is depicted here as a humble representation of the sun itself, gazing down upon the reunification of North and South Korean citizens. All under the North Korean flag, no less. Tongil Station, Chollima line. 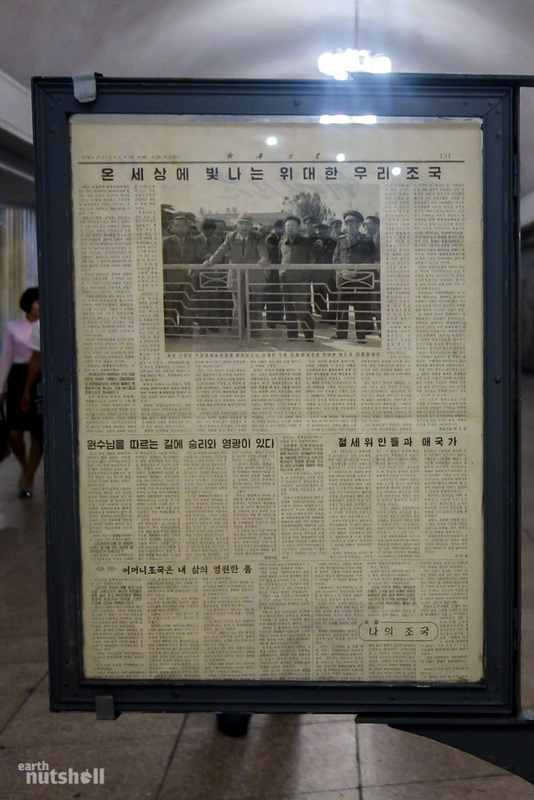 Today’s headline: “Our republic will prosper endlessly along the roadway to Juche.” This headline features the late President Kim Il-Sung, dead now for over twenty years. Juche is the national ideology of North Korea, the brainchild of President Kim Il-Sung that’s often translated as ‘self-reliance’ and is for all intents and purposes the religion of North Korea, technically an atheist nation. Juche is the cornerstone of North Korea’s ultra-nationalism, isolation, and seemingly political immunity. 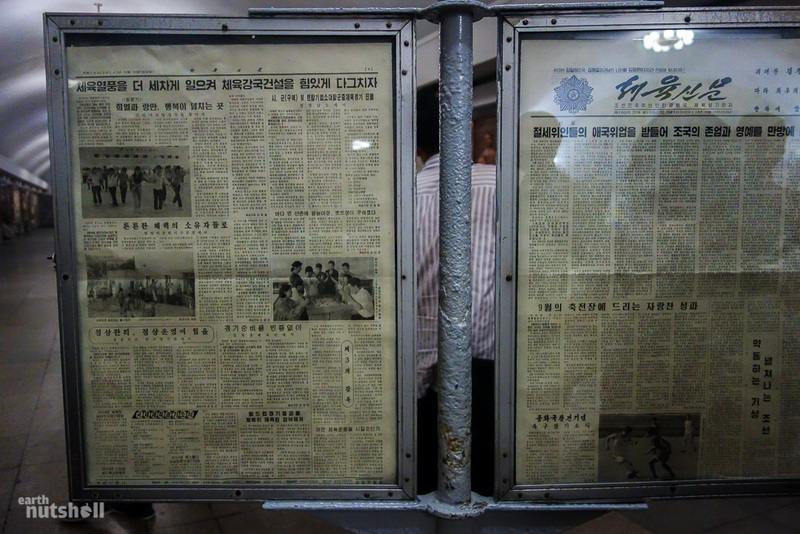 All news media in North Korea is tightly controlled and censored by the state. 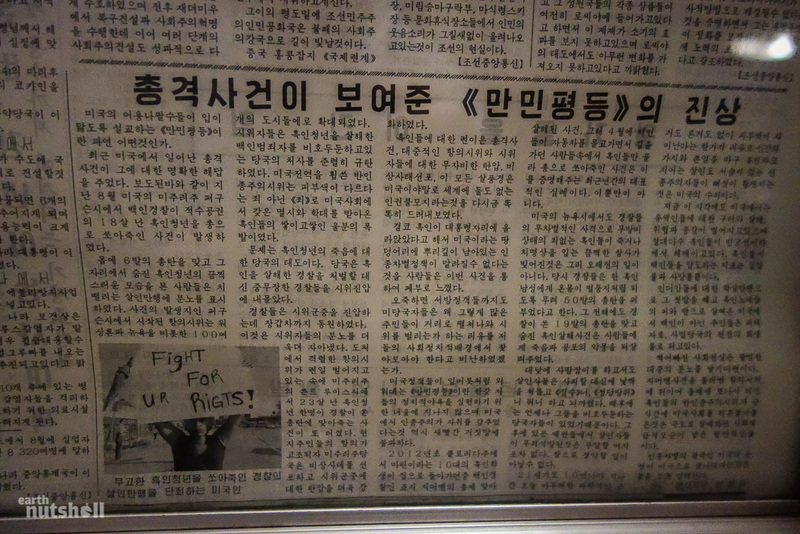 This is the Workers Newspaper ‘Rodong Sinmun’, the official press of the Workers’ Party of Korea. President Kim Il-Sung and I at Kaeson Station. In the past, this statue was a dull, boring white marble portrayal of the Great Man but has since received a gleaming upgrade. 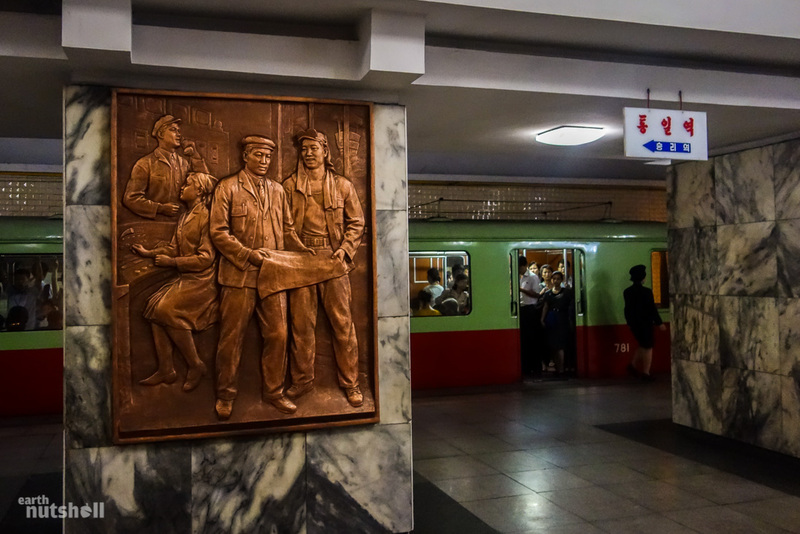 Kaeson translates to ‘Triumph’, each metro station is named referencing the socialist revolution (Comrade, Red Star, Glory, Complete Victory, etc.) and not by location. Kaeson is the only station to break this rule, with a referenceable landmark in the ‘Arch of Triumph’. As for the trains, we rode the cream of the crop. Berlin D-type hand-me-downs from Germany that were planned for scrap until North Korea purchased them back in 1999. These are now claimed as Korean-built. All indication of Berlin manufacture has been removed and the train numbers have been changed, however, remnants of scratch-tag graffiti from their past life in Germany could still be made out despite attempts to clean them up. They weren’t as bad as the imported trolley buses up at ground level, those things still had what appeared to be the portfolio works of Banksy on their windows. 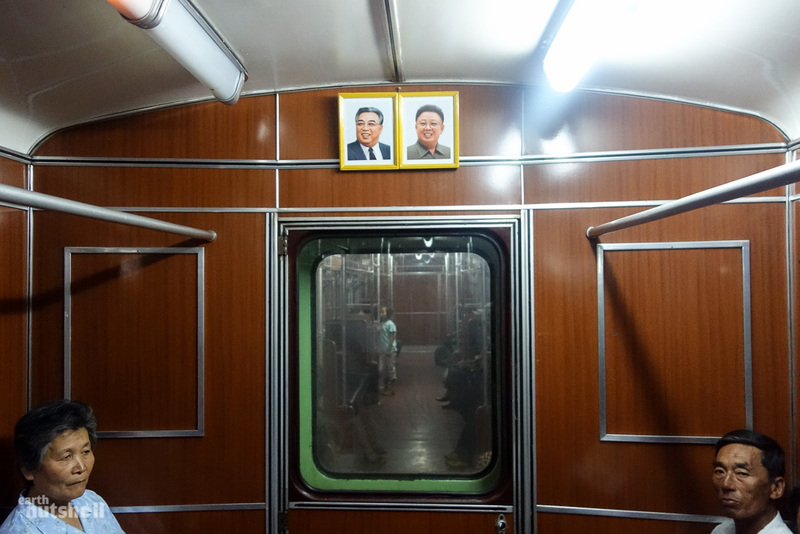 Portraits of President Kim Il-Sung and General Kim Jong-Il were present in every train carriage. By law, they’re framed thicker to the top and angle downwards to oversee those in any room they’re placed. Revolutionary anthems filled each carriage to otherwise silence, commuters didn’t speak or interact with each other and boarding or alighting the train was an effortless, polite process with self-organised order. 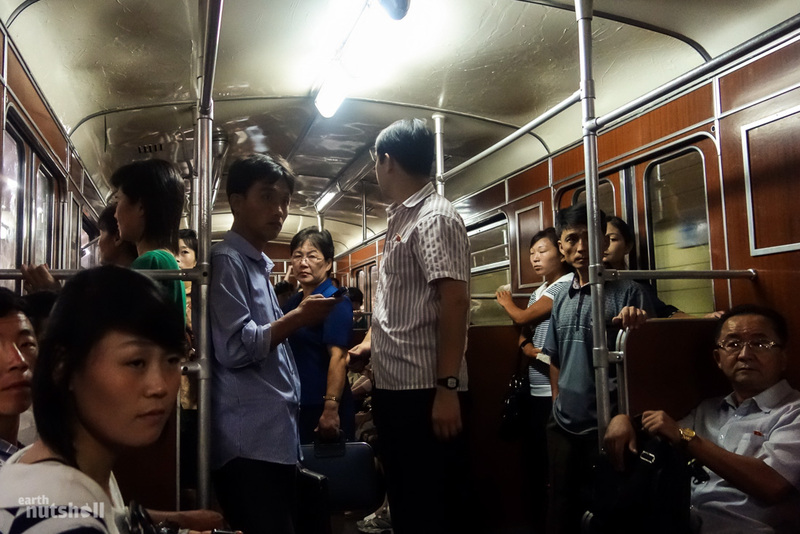 Those actively serving in Korean People’s Army are not above Pyongyang’s most efficient public transport system. Here I was spotted and received a stern look from a KPA General as he lined up to buy a ticket alike any other citizen. In a vase near the attendant, you can spot both a decorative purple Kimilsungia and red Kimjongilia. I’m unsure why the frosted glass hiding the attendants identity is necessary. Yonggwang Station, Chollima line. This is Yonggwang Station, the second and final stop for most tourists of the past. 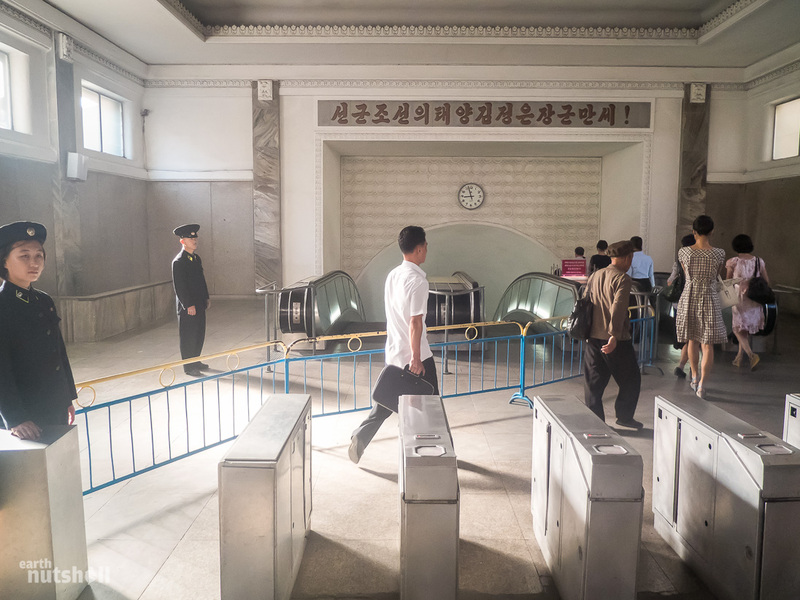 This arbitrary restriction spawned conspiracy theories that the Pyongyang Metro was merely two stations in total, and that the well-dressed commuters were just actors assigned to delude visitors into the impression of an extensive public transport system that didn’t actually exist. If you hadn’t realised yet, that is total hogwash. As an aside, the murals on each wall here are a massive eighty metres long. 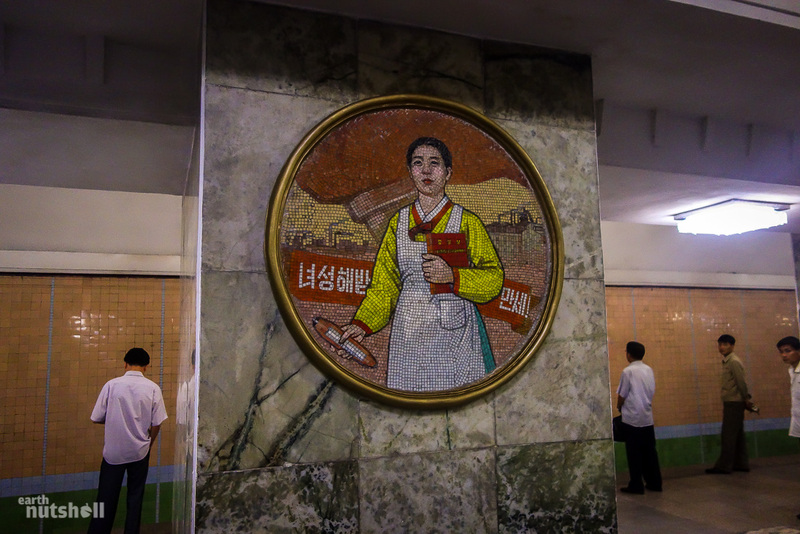 “Hurray to the liberation of women!” Chonu Station is the transfer station from Chollima to the only other officially recognised line, Hyoksin. There’s been some evidence to suggest another secretive line or network of lines exist restricted to government and military use only. 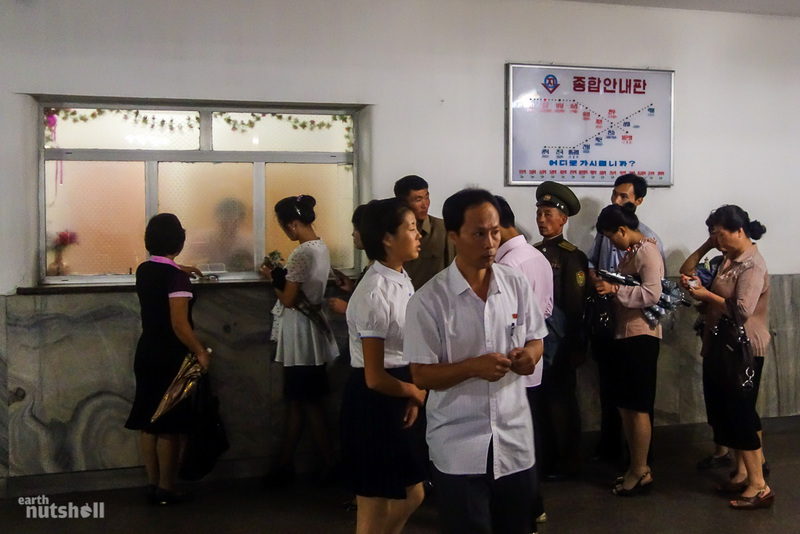 This evidence includes one prominent defector account and verification of North Korea importing over double the required number of train carriages required for their public system, even accounting for spares. Train attendants manning the Metro entry above ground. Public service roles in North Korea require military-inspired uniforms. The banner above the escalator reads: “Long Live General Kim Jong-Un, the Sun of Songun (military-first) Korea!” Puhung Station, Chollima line. 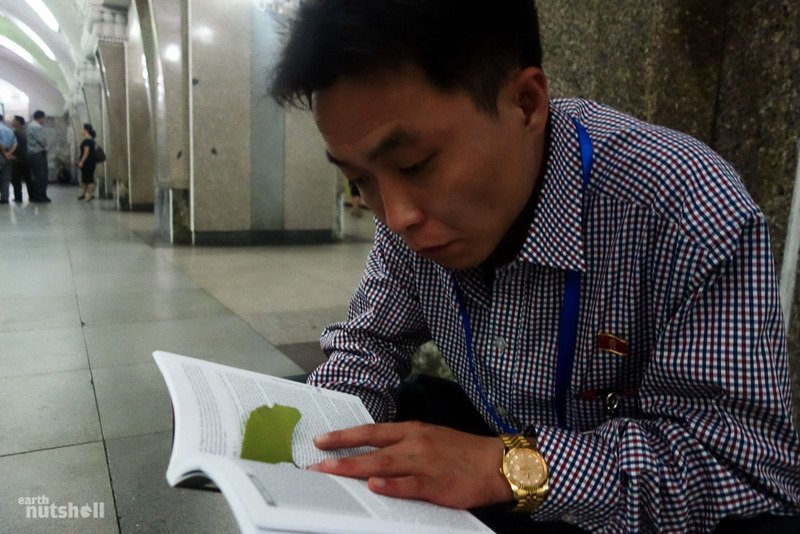 One of our North Korean guides reading a guidebook on North Korea. This book was allowed into the country after being cleared by customs. He was glued to it for hours, fascinated with an outside perspective of his beloved country. Hwanggumbol Station, Hyoksin line. “Out you go, U.S Military!” and “National Unification” are the translations here. 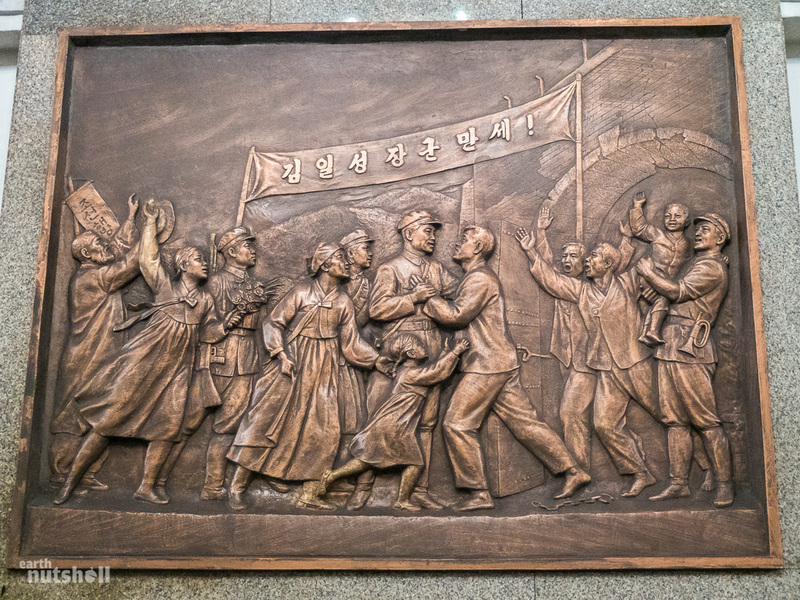 Bronze plaques depicting scenes of the Korean War, national productivity, reunification or victory celebration are standard inside most stations. Tongil Station, Chollima line. Two commuters reading the daily newspaper while awaiting their train. Okay, one commuter reading the daily newspaper, and another giving me the death stare. Hyoksin Station, Hyoksin line. 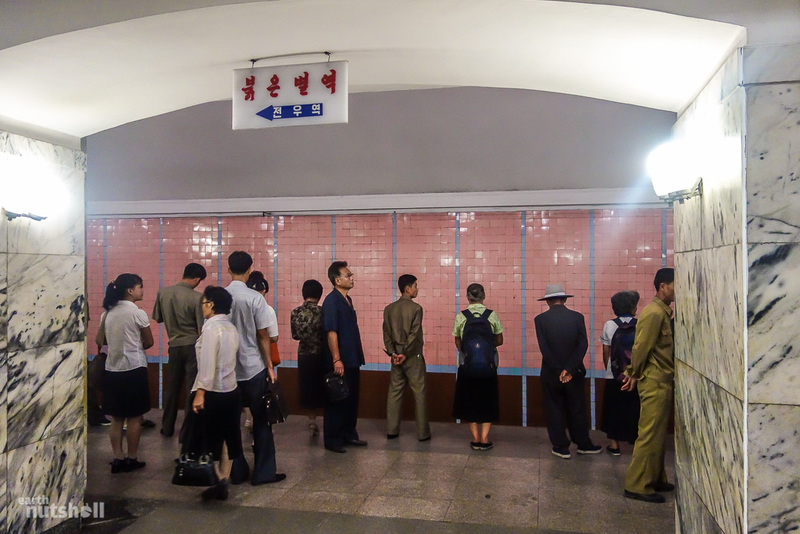 An electronic board on the Chollima line (red). Pressing one of the stations along the bottom lights up your route. I’m standing at the terminus, Puhung Station. 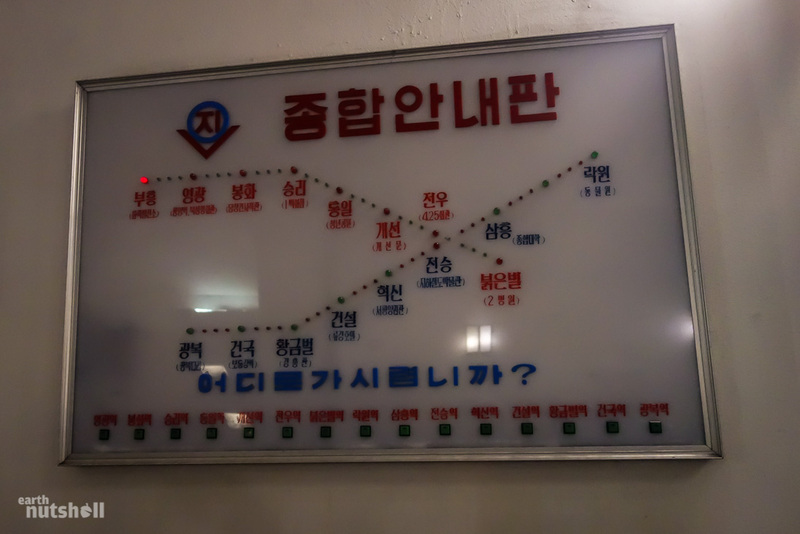 Here you can see clearly how far they previously allowed foreigners, literally one station to the right and then back. Today we visited both lines, beginning to end. 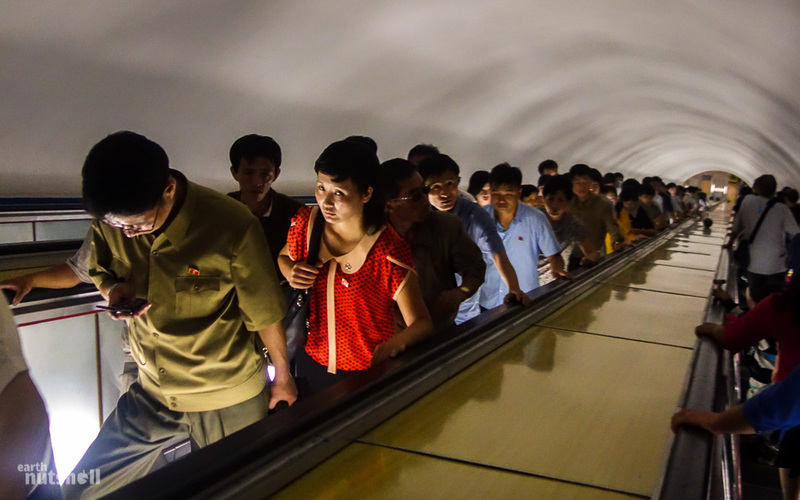 Seriously, the metro isn’t fake or choreographed, it’s an integral service to Pyongyang. 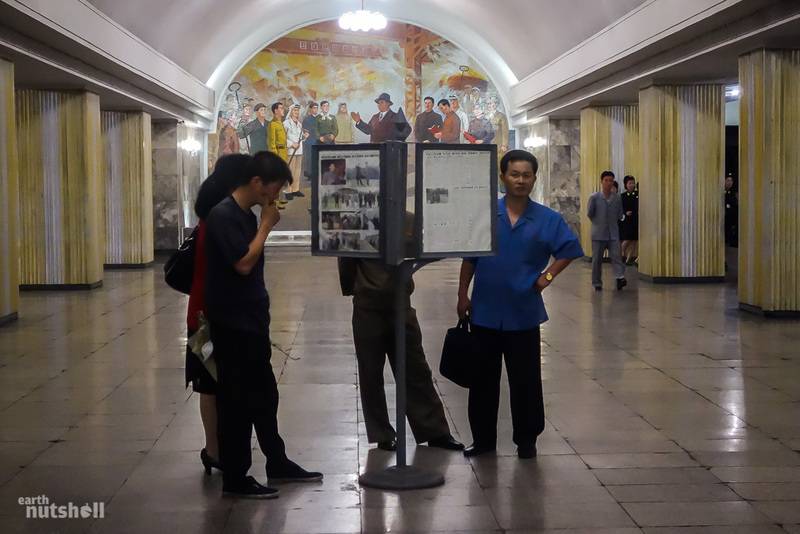 Catching the train with some Pyongyang locals. I thought this was a subtle snap, viewing it later proved otherwise. Commuters were nothing but polite, offering up seats to the elderly and even to us as foreigners. I’m unsure whether this was normality, or just for us. “Hurray to the glorious Workers’ Party of Korea!” Trains arrived every five to seven minutes, during peak times every two minutes. Before departures, the platforms were packed just as it would be anywhere else in the world. Protected by the flag of the Worker’s Party of Korea, the Korean people advance under the leadership of Eternal President Kim Il-Sung. You’ll notice each subject has a unique role; there’s the soldiers, naval officer, air force pilot, police, engineers, architect, mechanic, cleaner, cook, farmer, and peasant. 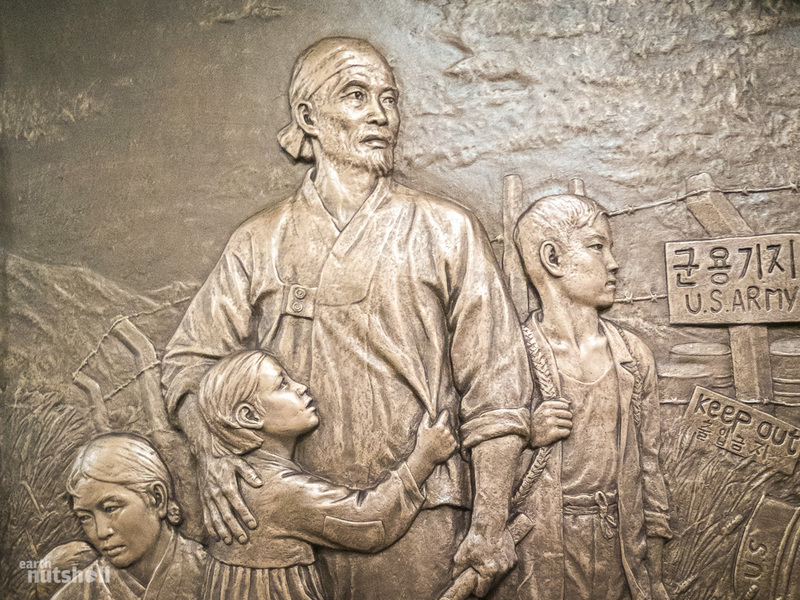 Everybody contributes to the wider success and victory of glorious Korea. This is motivating to the people irrespective of their profession. 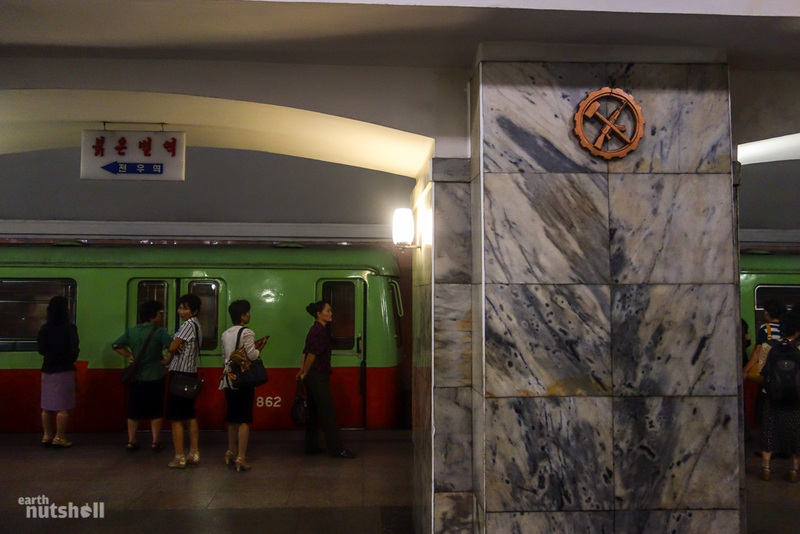 This is one of the most striking monuments in the Pyongyang Metro, and my favourite. Kwangbok Station sits in relative darkness, brightened only by this shining, spotless statue of Kim Il-Sung at the very end. It was quite creepy frankly. Her face could say one thousand words. This is what I assume to be either a group of conductors undergoing training or the next shift dispersing. The band around their arms directly translates to ‘Trainman’. Hyoksin Station, Hyoksin line. Street-level entry to Yonggwang Station. The banner translates: “Following the great leader of our party, let’s head towards the final victory!” The streets of Pyongyang are spotless, I don’t think I saw a single piece of litter in the city. This is the entrance to Konguk Station. We were the first foreign visitors ever allowed into this station. 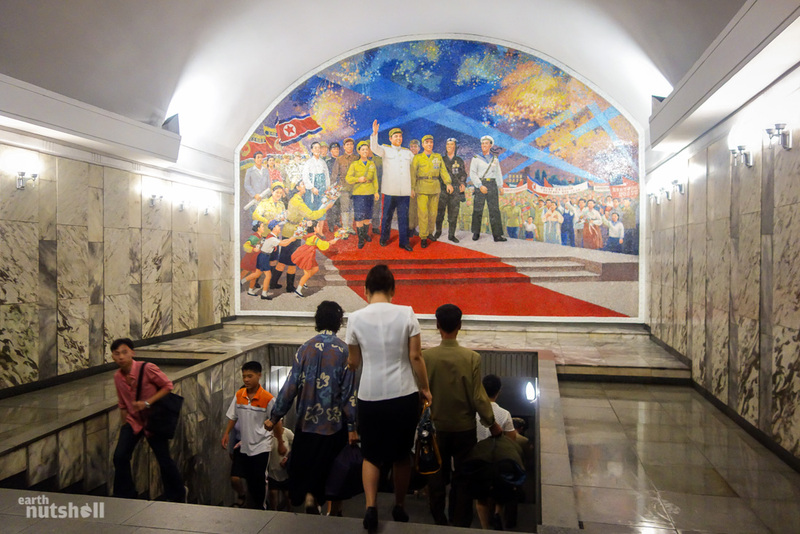 Foreign tour operators consistently try to extend the boundaries to traditional trips to Pyongyang. To use the Metro as an example, prior to 2010 just two stations were visitable, afterward, it became five, then six, and now today we had access to all sixteen stations. 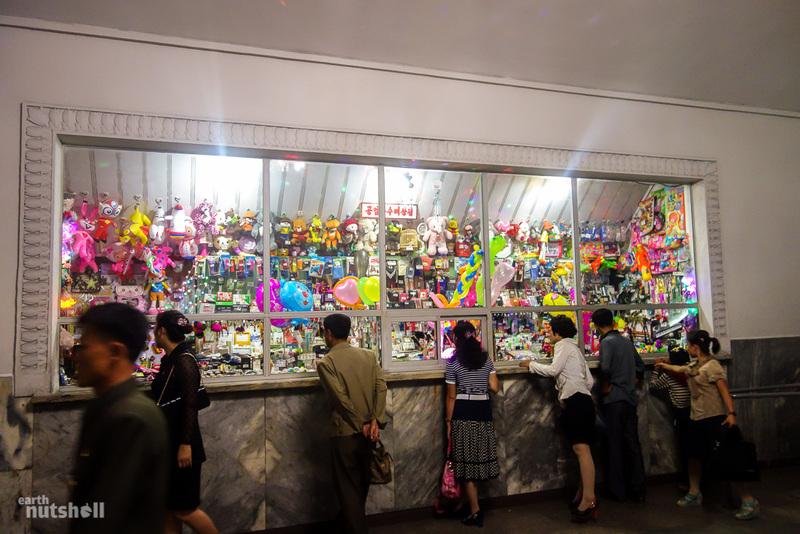 To those involved, these baby steps form part of the bigger picture of North Korean tourism. Another foreign tour guide joined us on this visit purely to enter Konguk for the first time, they commemorated the event with a polaroid picture to take out and put in their office. 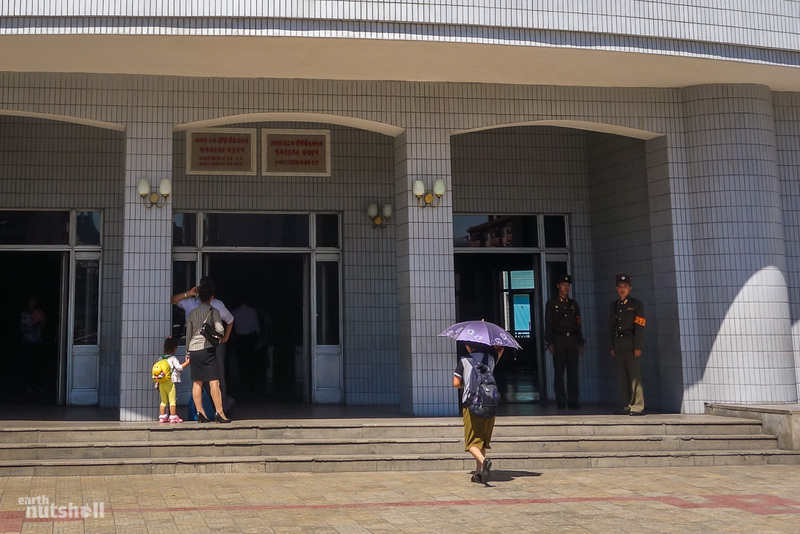 This may seem sad to you, it’s just a train station after all, but consider the bureaucratic nightmare that is North Korea. Progress is nothing to scoff at. 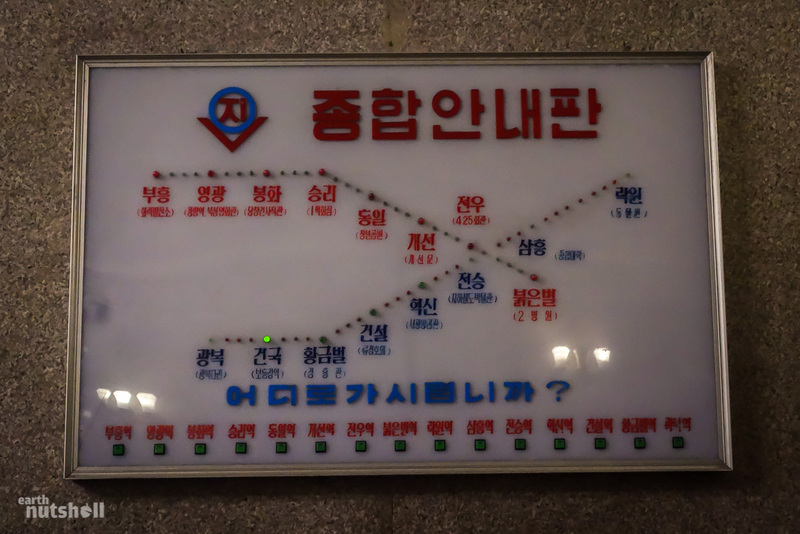 The electronic board from the lesser-seen Hyoksin line, not only that, the photo is taken from inside Konguk Station itself! Both of these lines are completely located on the western side of Pyongyang due to a major accident that occurred attempting to extend the Metro under the Taedong River in 1971 killing at least one hundred workers. The tunnel was never completed. 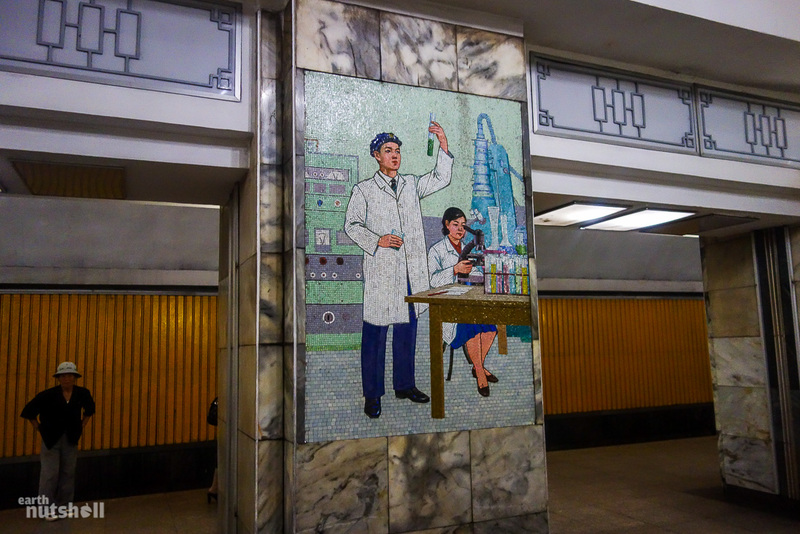 All hype aside, Konguk Station was similar to the others – shined marble floors clean enough to eat from, walls you’d sooner expect inside mansions of the rich and famous and dimmed platforms brightened only for one man, the man himself…President Kim Il-Sung. 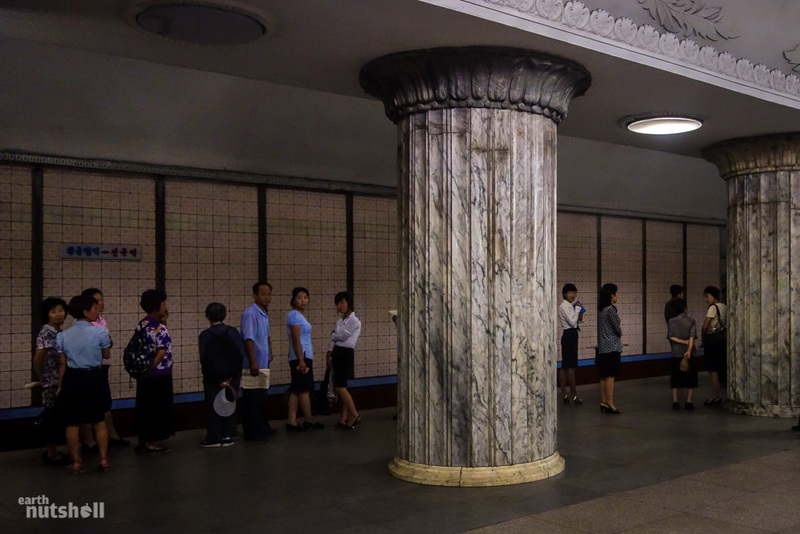 However, Konguk Station was unique in having giant marble pillars. Ancient Greek architecture right here in North Korea. The look of shock on the faces of commuters tells the story of our visit into this station. 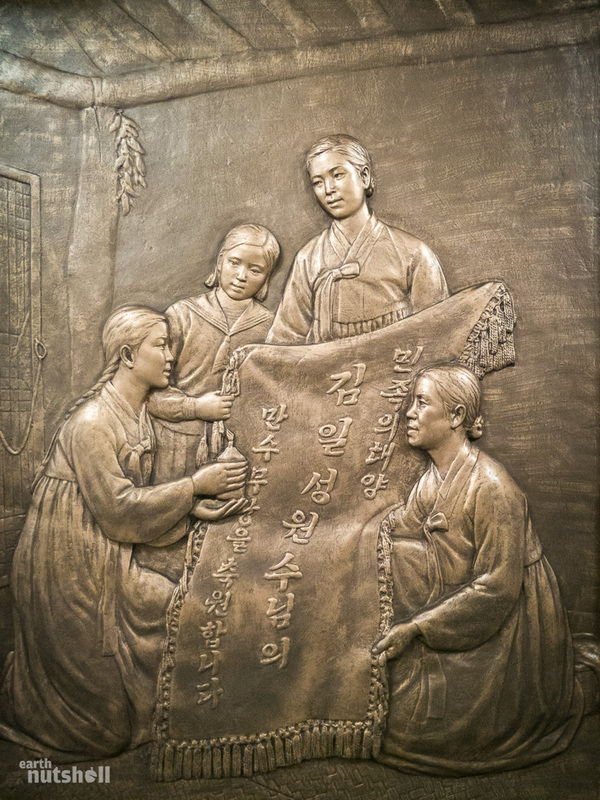 This bronze plaque depicts a working class North Korean family being displaced and repressed by the U.S Army during the Korean War. It appears as though it may be bordering the Demilitarized Zone. The anti-US sentiment is still fundamental to much of North Koren artworks. Tongil Station, Chollima line. At thirty metres long, this mural commemorates the independence of Korea in 1945, ‘Victory over Japan Day’ when the peninsula was liberated from Japanese rule. Kaeson Station, Chollima line. 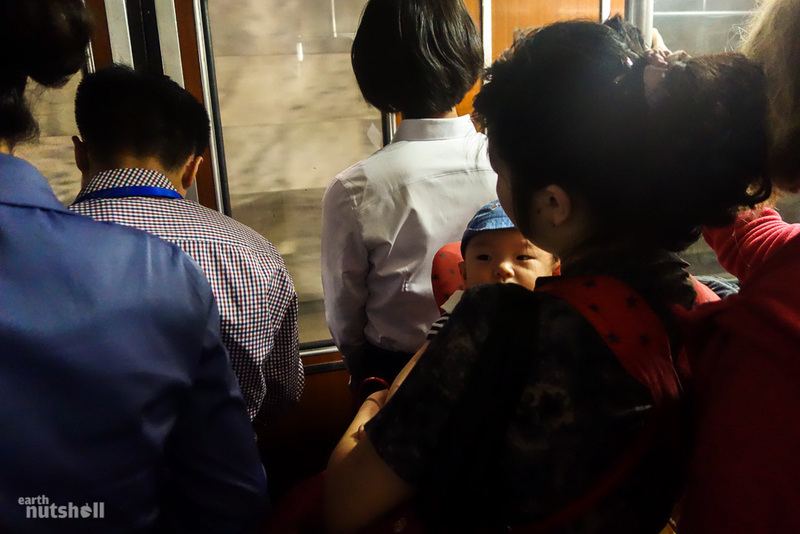 Nobody ran, pushed, laughed or smiled in the Pyongyang Metro, there was no chatter, oh and it took me off guard to witness the beginning of the future – lives consumed by electronics. It certainly felt familiar. 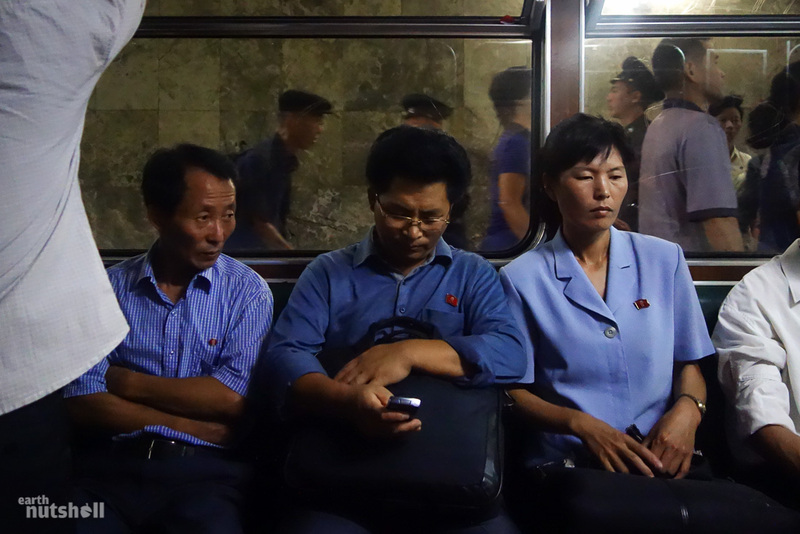 Mobile phones are common to those in the larger cities of North Korea, at last estimate over 10% of the population now owns one, anything from an old brick bar-phone to an Apple iPhone. They can’t call internationally, and there’s no internet connection, but it’s a start. In this photo, you can spot the different types of lapel pins available (and mandatory) to citizens, the double portrait version purchasable by the elite is not pictured here. 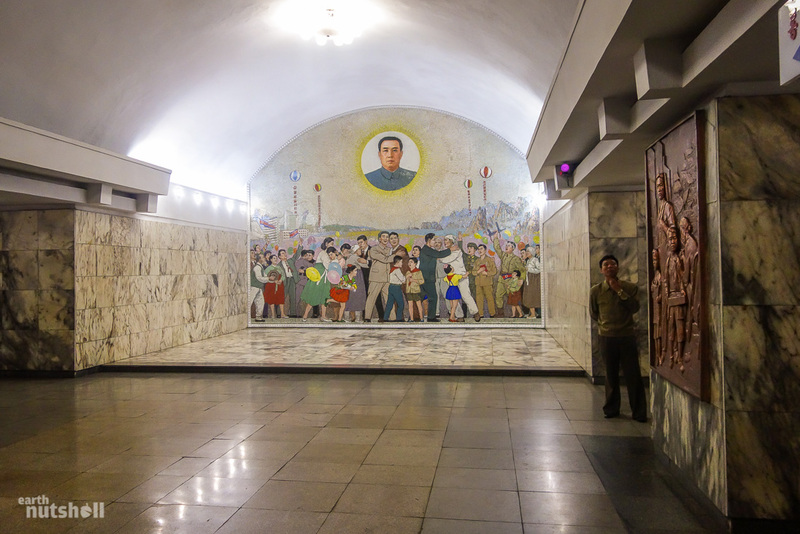 General Kim Jong-Il doesn’t feature as much as I’m sure he’d like in the Pyongyang Metro, although this may change. 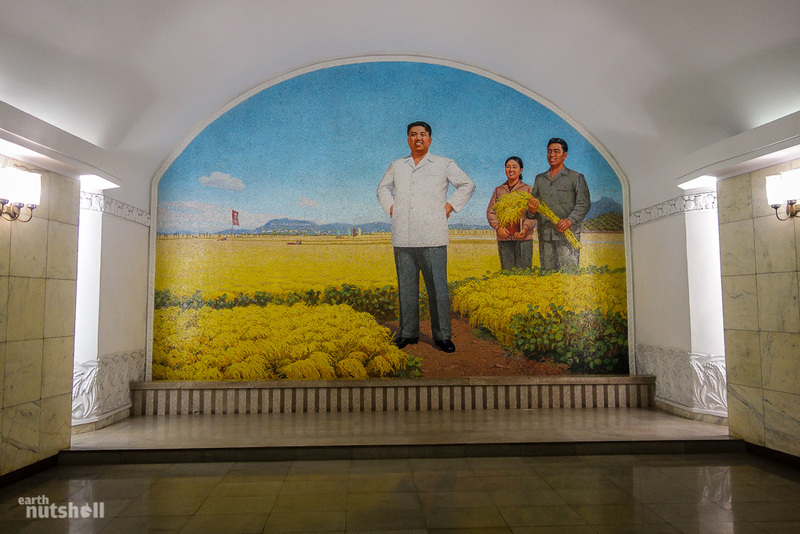 As recent as 2013, this mural used to be of North Korea’s more sacred site, Mount Paekdu. Mount Paekdu is the highest mountain on the Korean Peninsula and North Korean state media has always claimed General Kim Jong-Il was born at the peak in a secret military camp. Soviet records, however, indicate he was actually born in Russia. Yonggwang Station, Chollima line. The extra detail put into the face of President Kim Il-Sung is evident here. 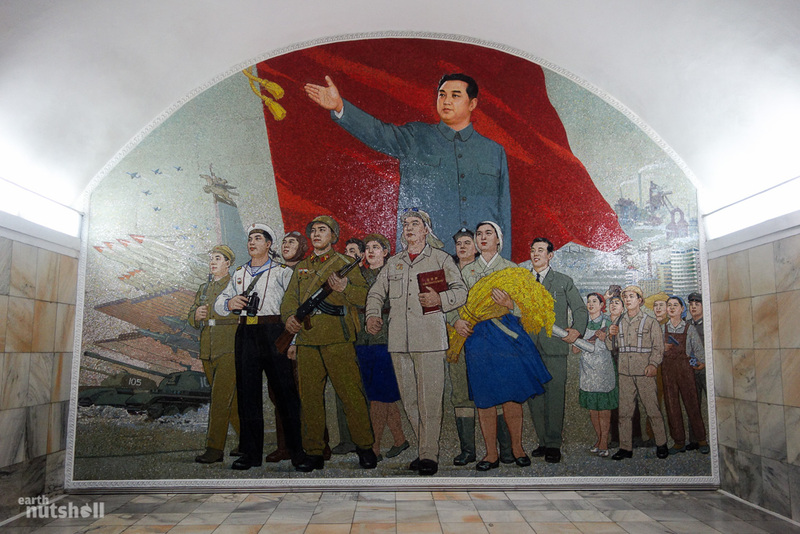 Each person in every mural is smiling, it’s imperative that President Kim Il-Sung is portrayed as a man of the people, a role model and source of inspiration for children and adults alike. 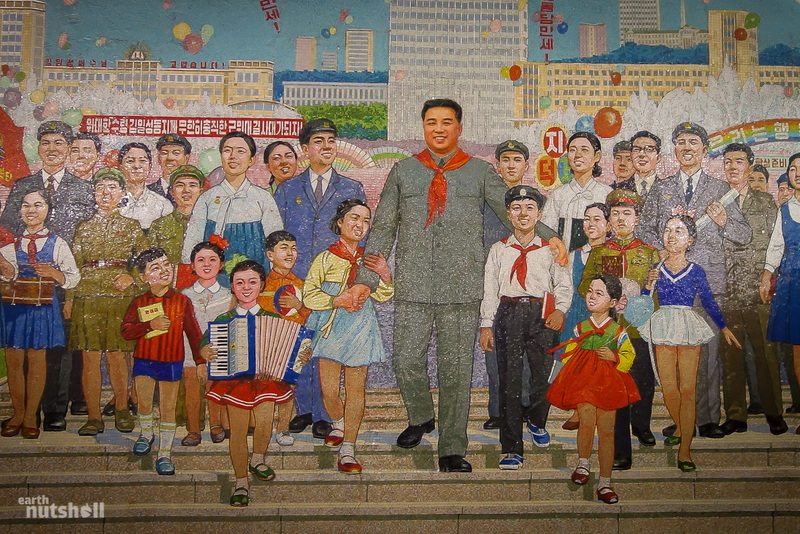 However, I felt many of the murals with children came across as creepy, one at the orphanage in Nampo in particular. You’ll be sometimes greeted by KPA military police when entering the stations. Their armbands translate ‘Inspection’. 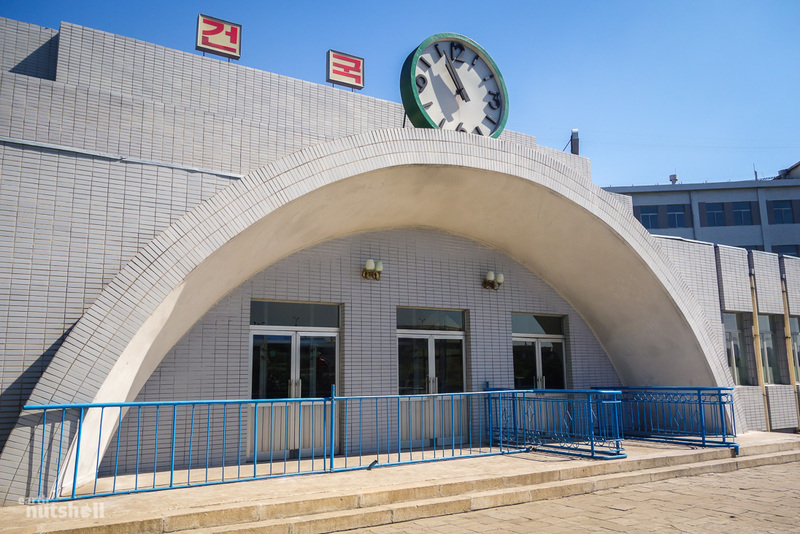 The signs above the entrance doors translate to: “The Hwanggumbol Station our great leader Kim Jong-Un has made for us through field guidance.” It then lists the dates, interestingly written as ‘Juche 67’ and ‘Juche 71’. North Korea doesn’t use the traditional Gregorian calendar, they use the ‘Juche’ calendar, pivoted from the date of President Kim Il-Sung’s birth, Juche 1. A train about to depart on time behind one of the many bronze plaques in Tongil Station on the Chollima line. 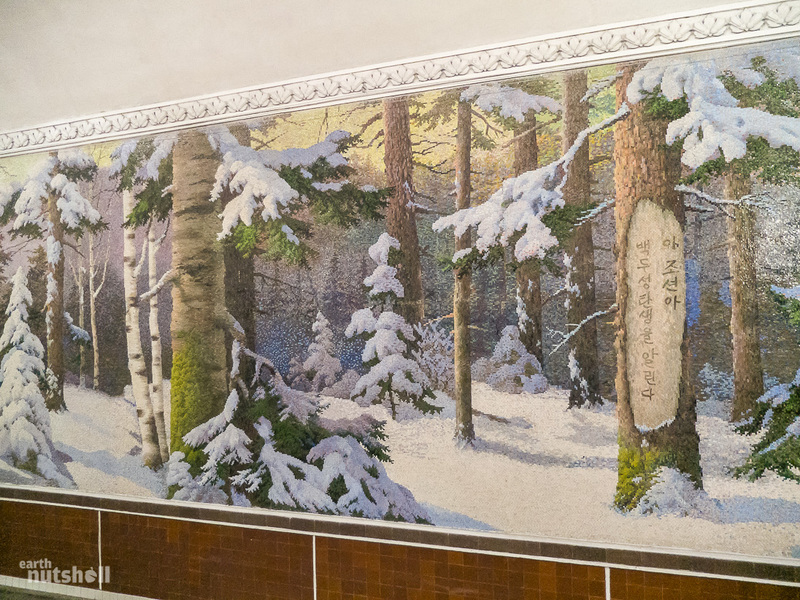 “Oh Chosun (the historical term referring to Korea), here we announce the birth of Baekdoo (referring to General Kim Jong-Il).” This mural depicts the sacred ‘Slogan Trees’ which are places of pilgrimage for North Koreans. I visited one of these trees in Pujon County in the north-east – it was a tree, encased in glass, protected by shutters and inscribed with a revolutionary slogan. 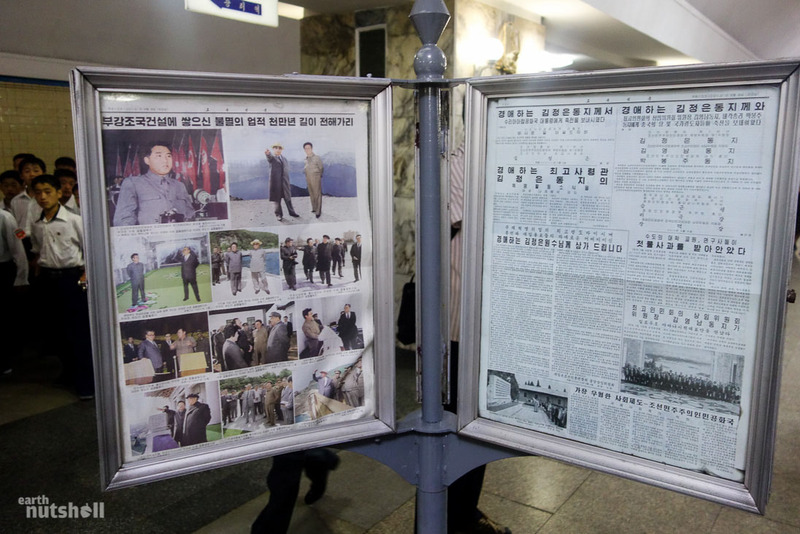 State media claim the slogans were made by soldiers of this ‘secret military camp’ headed by President Kim Il-Sung in tribute to the birth of General Kim Jong-Il. In reality, Soviet records indicate President Kim Il-Sung spent this time in exile in Russia. Kwangbok Station, Hyoksin line. 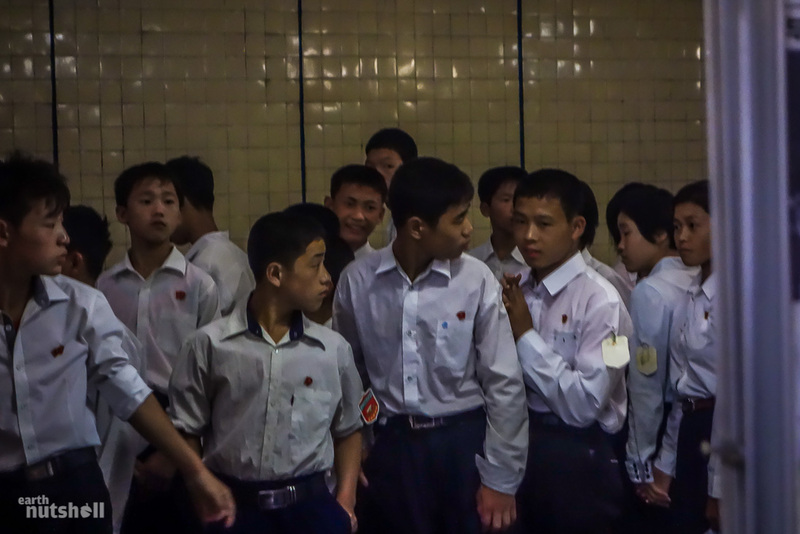 Schoolchildren led by their teachers regularly use the Pyongyang Metro. I’m unsure why the students have tags attached to their arm, any guesses? Ponghwa Station, Chollima line. 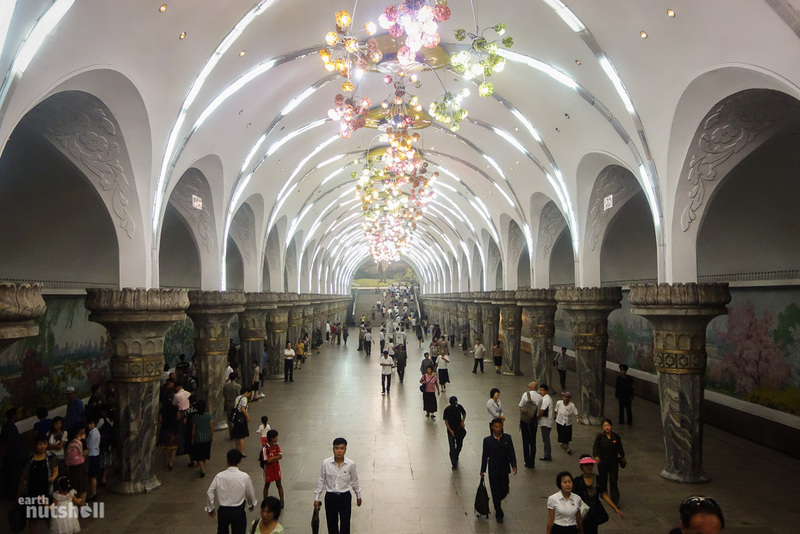 An example of the grandiose chandeliers found inside the Pyongyang Metro. This one was at the top of an escalator at ground level. The extravagance underground is designed to bring affluence and luxury to the lives of even the lower working class, serving as inspiration in pursuing national goals. Hwanggumbol, Hyoksin line. 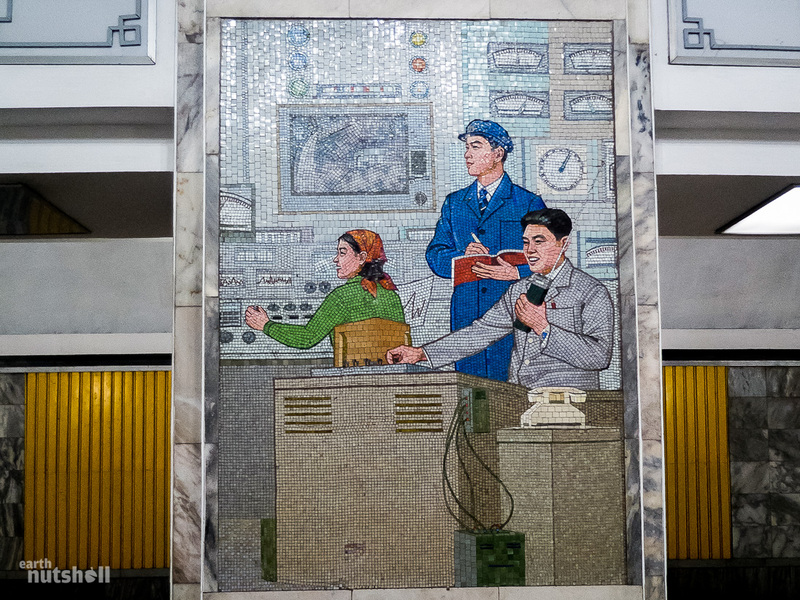 “Hurray to our General Kim Il-Sung, the outstandingly wise leader!” Kaeson Station, Chollima line. A mother carrying her baby, a scene that could be captured anywhere in the world, and I liked this photo for that reason. The baby even has a hat on that’s stitched with a cartoon character. Freedom of expression, even fiction through art is primarily thought to be forbidden in North Korea, which for the most part, it certainly is. However, it appeared that children until a certain age are afforded the luxury to be dressed however their parents pleased; bright colours, patterned clothing and prints of fictional characters that even featured in books and toys. Another North Korean abstraction of the unmistakable communist symbol, the hammer and sickle. Out with agriculture, in with the AK-47. Maybe not the wisest move from an economic standpoint but for a self-confessed military-first state, it may well be more accurate. Pulgunbyol Station, Chollima line. President Kim Il-Sung reading a book about President Kim Il-Sung. 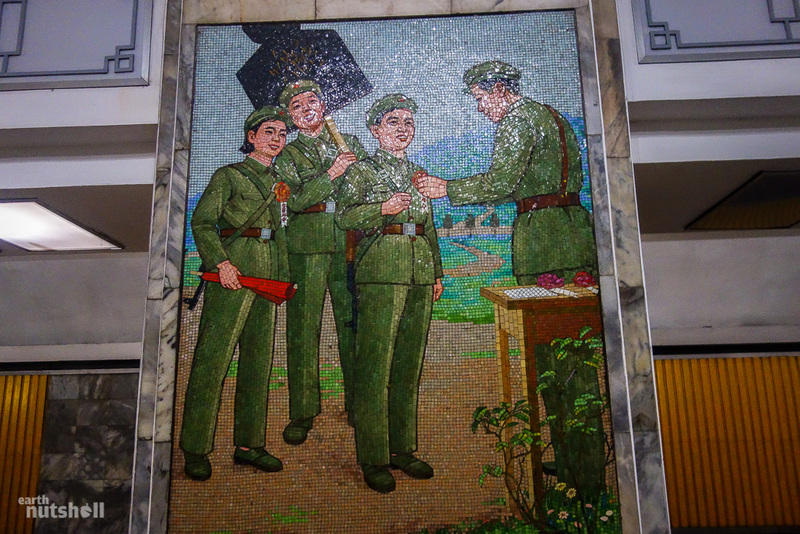 “The Nations Sun, leader Kim Il-Sung.” Tongil Station, Chollima line. President Kim Il-Sung and General Kim Jong-Il appear in daily newspapers inspecting factories, educational facilities, agriculture plantations or military installations just as if they’re current events. This was in today’s paper. 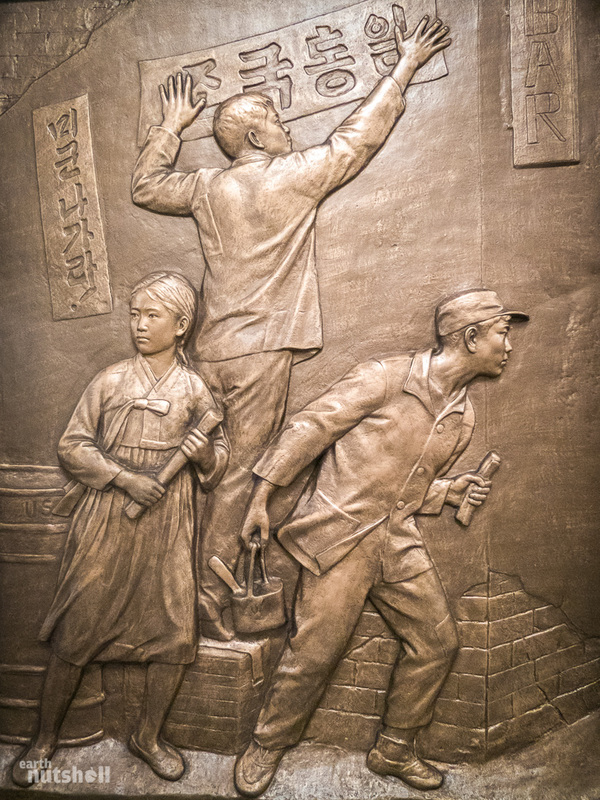 “Let the immortal achievements built by the Workers’ Party of Korea last for as long as ten million years.” Ponghwa Station, Chollima line. 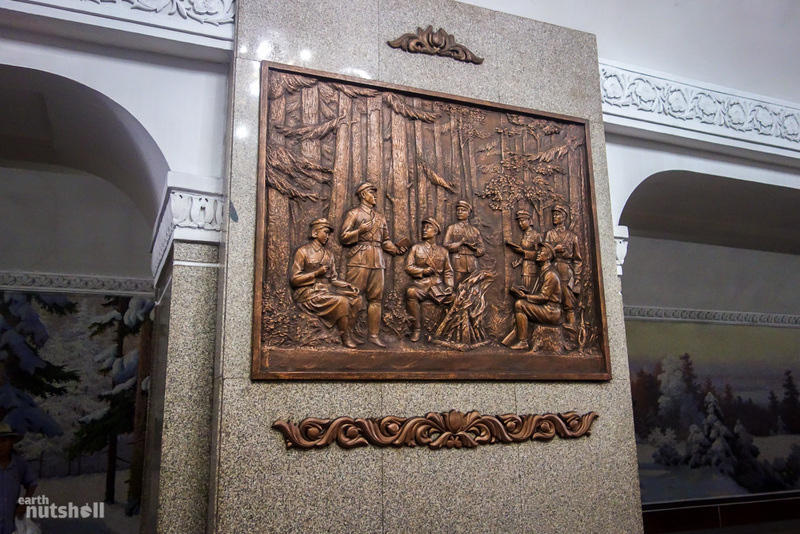 This plaque depicts military encampments in the northern forests of North Korea. Kwangbok Station, Hyoksin line. The anti-Japanese revolutionary struggle. Kwangbok Station, Hyoksin line. President Kim Il-Sung announcing his plans to rebuild the modern city of Pyongyang following the destruction from the Korean War. This was in 1953, the day after the armistice between the North and South of Korea was signed. 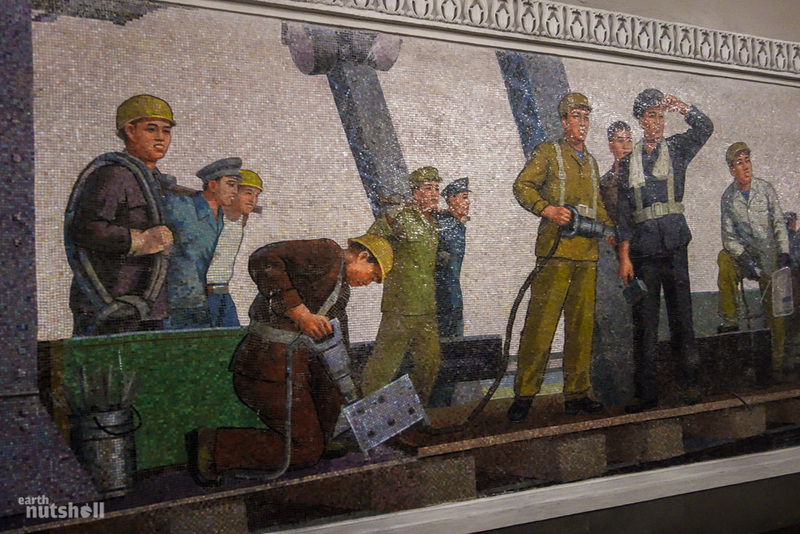 There are other huge murals in Konsol Station showcasing heavy industry, construction sites and builders working through blood, sweat, and tears to recreate President Kim Il-Sung’s vision of a showcase capital, a living testament to socialist efficiency and accomplishment. Hwanggumbol Station, or ‘Golden Soil’ Station, has platforms suitably celebrating the agriculture and farming industry. North Korea’s model of self-sufficiency heavily relies upon cooperative farming to feed the population. This over-reliance, combined with torrential flooding and restricted Soviet food-aid in the 1990’s contributed to the humanitarian crisis we know as the North Korean famine. Inside North Korea, this disaster is known as the ‘Arduous March,’ an optimistic term coined by the regime to defer state responsibility and its failure in preventing countrywide hunger. Inside the crowded, screeching tubes of trains, oil, and axle grease of metro systems all over the world, the walls are usually a stark reminder of why graffiti is rightfully illegal. In North Korea, graffiti carries harsh, unspeakable punishment. 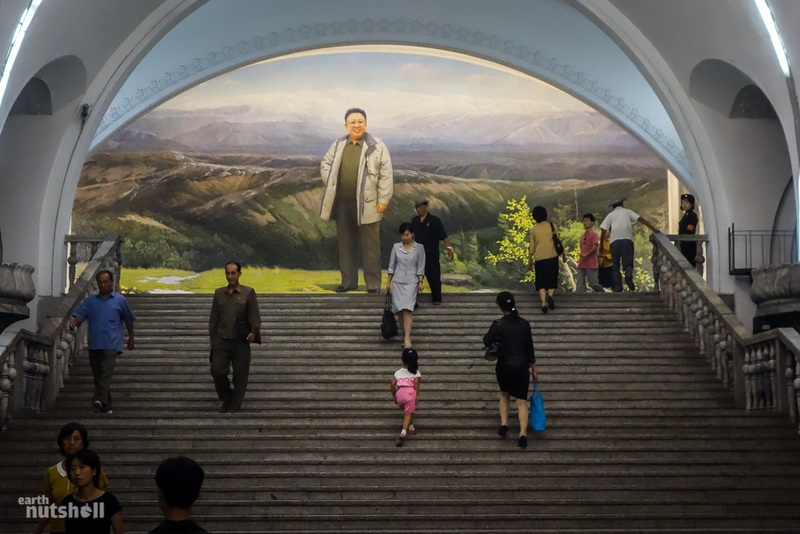 In 2011, graffiti denouncing General Kim Jong-Il found in a college sent the capital city of Pyongyang into literal lockdown, the regime refused to sell train tickets until the culprit was found. 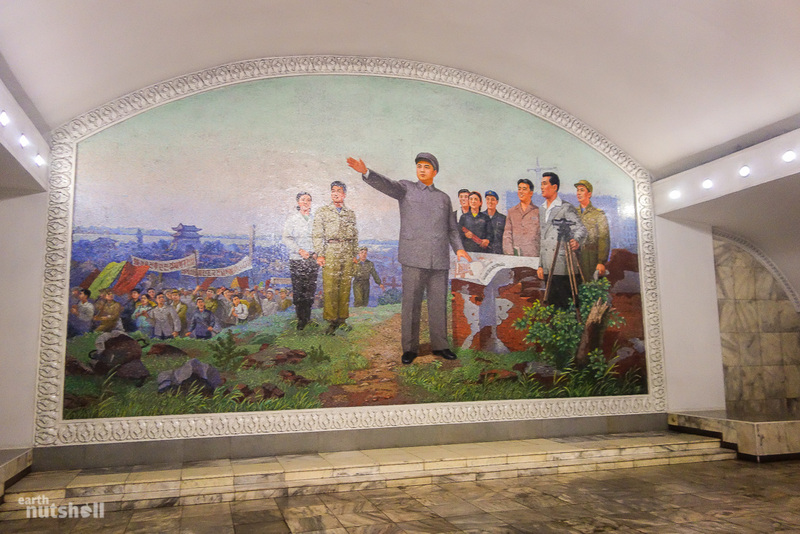 In my time inside North Korea, I have not spotted one single instance of graffiti or defacement. Luminous eye-catching gold watches are a clear symbol of affluence in North Korea. Oversized, loose-fitting shirts, silk suit jackets, and pants or neat blouses and skirts make up most of the daily style choices. Even in rural areas, men wear shining silk suit jackets on bare skin in the heat. 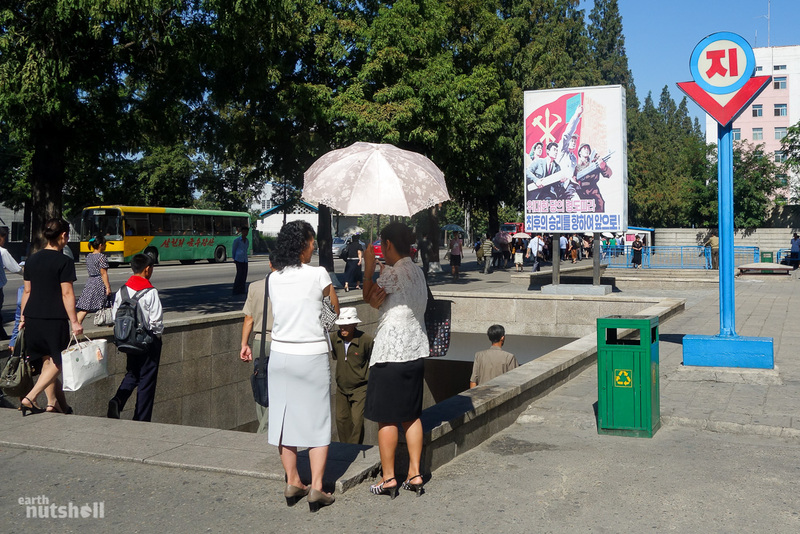 Branding and advertising don’t exist in North Korea as a result of virtually zero market freedom, leaving clothing design and distribution up to the state. Oddly, I couldn’t help but notice how commonplace blue socks were in North Korea, even in formal dress. Weird. Hyoksin Station, Hyoksin line. “The truth of the nation’s equality as shown by shooting cases” Korean Central News Agency reported on the United States Ferguson protests and riots of a fatal shooting by a police officer. The coverage painted the United States as a ‘gloomy society, where people are subjected to discrimination and contempt for no other reason than their races and skin colour and are in constant fear of being shot to death’, as quoted by the North Korean Foreign Ministry spokesman. Considering the misspelling, I thought I could find the source of the photo on the internet. I came up with no results. Edit: Many of you found it, thank you. The image was distributed by Chinese sources. Another scene of Korean reunification under the rule of President Kim Il-Sung. 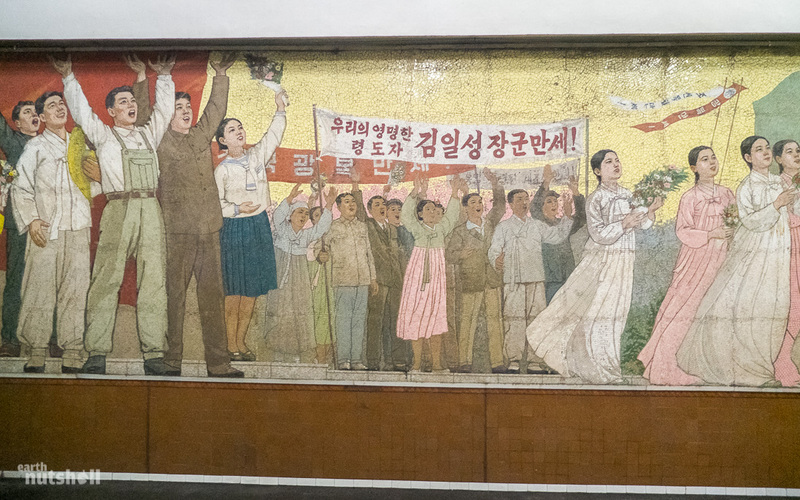 The banner reads: “Hurray to General Kim Il-Sung!” Kwangbok Station, Hyoksin line. 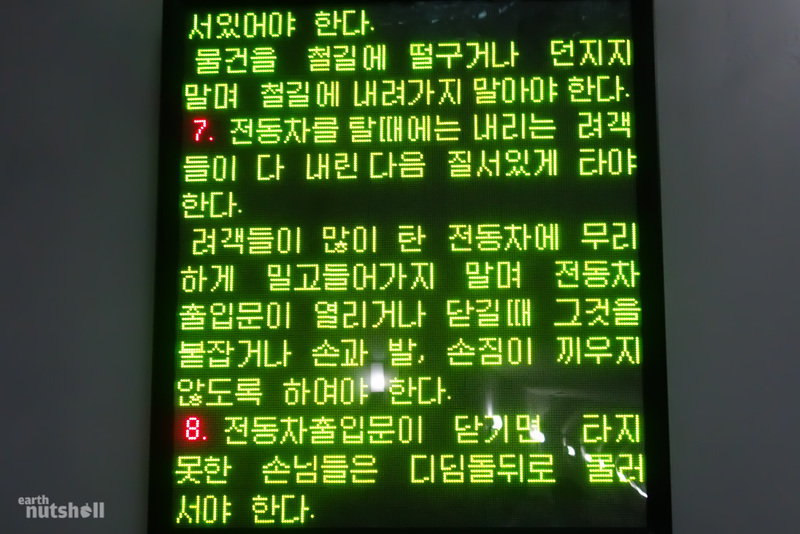 A station board outlining ‘rules’ of the Pyongyang Metro. The first item indicates you must wait for commuters to disembark before entering in an orderly manner, no pushing or holding the door in case of dangers to your hands or feet. Good advice considering the doors close with the force of a guillotine. The second item indicates once the door closes, to take a step back into the waiting zone. 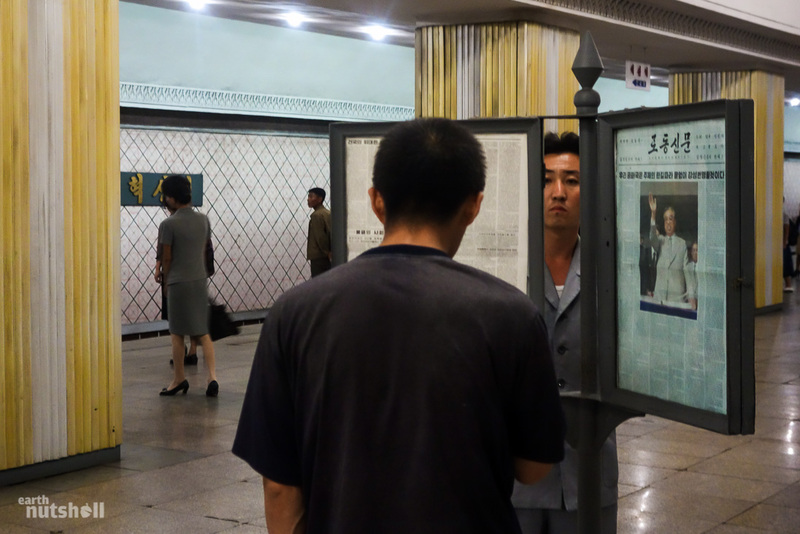 Boring, totally standard metro etiquette, even in North Korea. 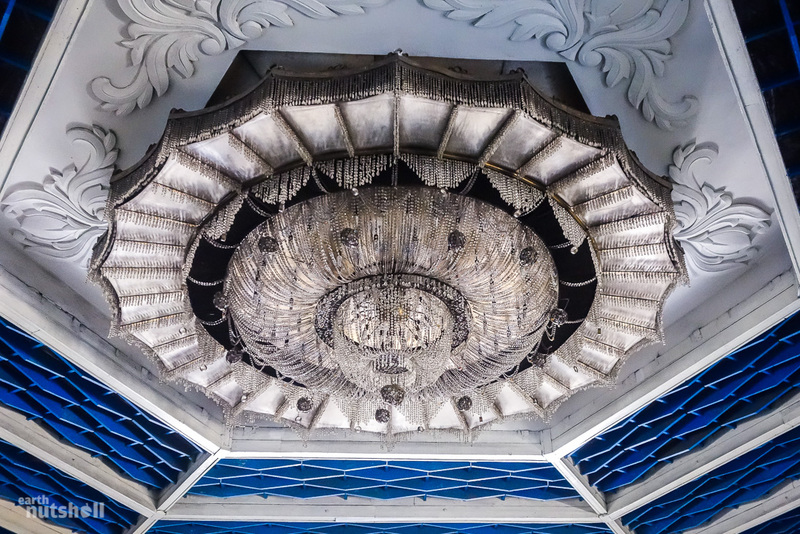 Low-hanging chandeliers did their best to brighten most stations. The tube remained pitch black and the trains themselves were very dark inside, some had flickering lights, and the doors were manually operated. 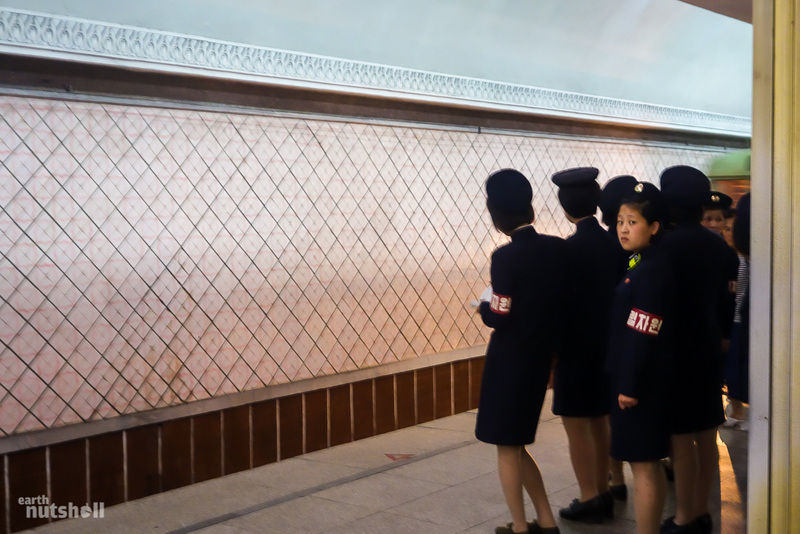 Train attendants at each station moved in a purposeful, militaristic manner similar to that of the Pyongyang traffic ladies, raising their paddles each time the train arrived or departed. Konsol Station, Hyoksin line. 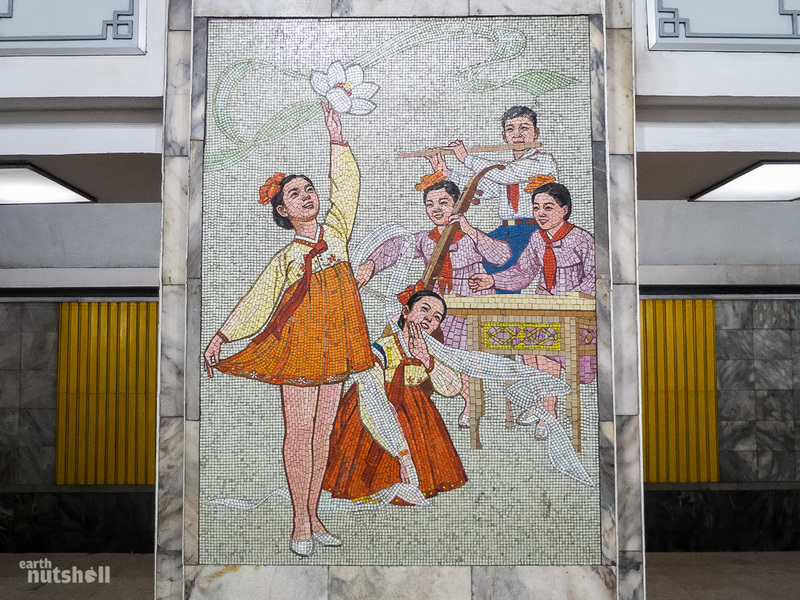 You can see here just how many pieces make up only a small section of each mosaic, of which there must be close to one hundred in the Pyongyang Metro. Konsol Station, Hyoksin line. “Maximise increased production and saving of money” President Kim Il-Sung giving an inspirational speech to those working in fields of industry. Hyoksin Station, Hyoksin line. The way men stand with their hands interlocked behind their back is a mannerism I noticed prominent all over North Korea. It is habitual as a result of their years of military service discipline. Pulgunbyol Station, Chollima line. Another snippet from today’s newspaper. The headings read: “Our great fatherland is shining to the rest of the world!”, “There is victory and glory along the road of following our leader”, “The great men and our national anthem.” Hyoksin Station, Hyoksin line. North Korea has adopted General Kim Jong-Il’s Songun (military-first) policy which means expenditures, allocation of resources and national affairs are wholly prioritised towards the interests of Korean People’s Army. If you’ve yet to notice, they’re quite proud of having one of the largest active military forces on earth, both men and women are indoctrinated early into accepting military influence as normality in their everyday lives. For men, military conscription is a gruelling 11 years, the longest of any country. Samhung Station, Hyoksin line. North Korea is also proud of their scientific advancement, in particular, nuclear breakthroughs. We know too well that this is flaunted politically to the rest of the world, it’s North Korea’s chief propaganda export. 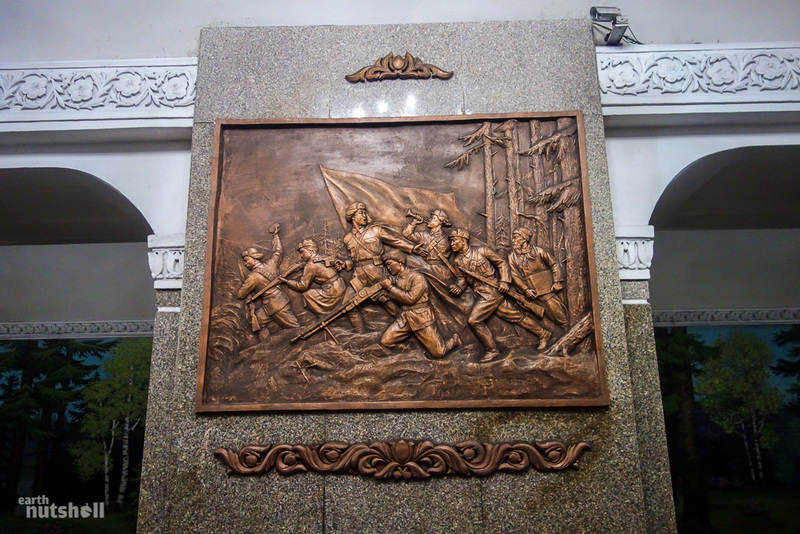 Samhung Station is an overall celebration of President Kim Il-Sung’s ‘Three Revolutions’ – the Ideological, Technical and Cultural aspects of North Korea. 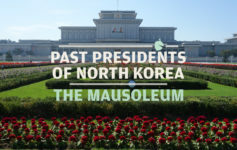 There’s even an exhibition of the same name in Pyongyang. Sporting achievements are also showcased. You may laugh, but would you believe me if I told you North Korea is legitimately home to the largest sporting stadium on earth? The Rungrado May Day Stadium, a capacity of 150,000 people. Yes, I was just as surprised. This mural went up a considerable time ago. I’d tell you that the technology promoted has far progressed beyond this point, but I’m not so sure. In all seriousness, Windows XP desktop PC’s appeared to be the weapon of choice for most computer systems in North Korea. Samhung Station, Hyoksin line. Imagine the opening ceremony of the Olympics, but with 100,000 participants performing a ultra-nationalist, synchronized socialist-realist spectacular of politicised gymnastics. That’s North Korea’s ‘Arirang Mass Games’. Participants are primarily students and children who practice every day for almost six months to perform for three months, leaving many observers concerned over human rights violations. Beyond the making-of, the performance itself cannot be faulted. It’s a logistical masterpiece needing to be seen to be believed. It’s no wonder North Koreans are proud of their performing arts. 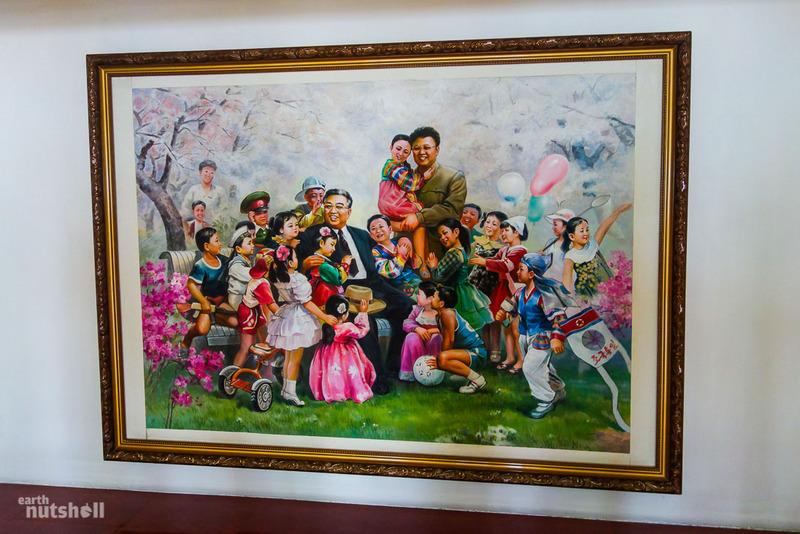 “We pray for the nations sun, leader Kim Il-Sung’s long life.” Embroidery and calligraphy are well-respected skills in North Korea and gifted children will go to extracurricular classes in the Mangyongdae Children’s Palace or Pyongyang Children’s Palace to reach their full potential in either field. Tongil Station, Chollima line. “We shall strike powerfully and construct the nation into an athletic powerhouse by vigorously stirring up a physical education frenzy!”, “Serve the patriotic achievements of the representative men to present dignity and honour of the homeland to the entire nation.”, “Freshly built pool and port resorts in mountain villages of the sea.”, “Presenting the proud accomplishments of the September celebration event (National Day).”, “Stirring weather, overflowing Chosun (Korea).” Tongil Station, Chollima line. 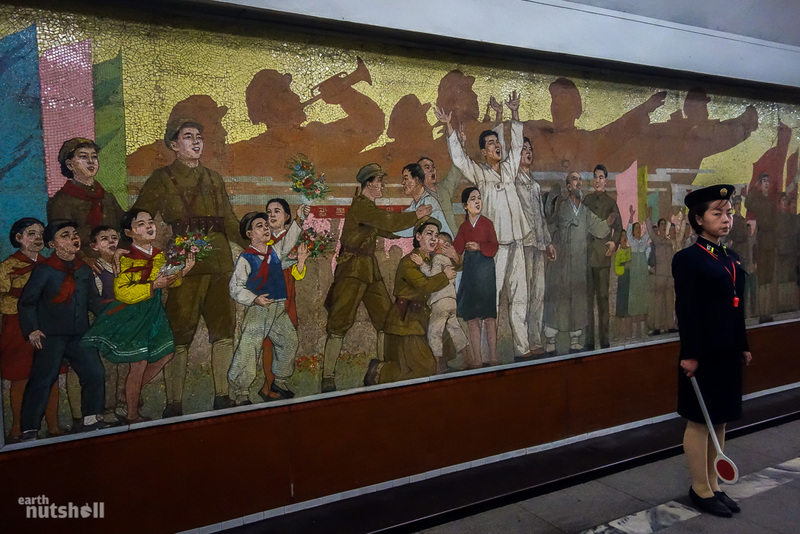 My favourite mural in the Pyongyang Metro. It’s bright, proud and perfectly fitting to Hwanggumbol Station, otherwise known as ‘Golden Soil.’ You may notice how similar President Kim Il-Sung looks here to Marshal Kim Jong-Un currently. It’s become quite clear to North Korea watchers that Marshal Kim Jong-Un consciously strives to emulate the likeness and mannerisms of his endeared grandfather. President Kim Il-Sung represents a time of unprecedented prosperity. This gives you a better idea of how prominent each monument is to each station. You can always rely upon President Kim Il-Sung and his glowing smile. Kaeson Station, Chollima line. An ‘Industrial Purchase Shop’ inside Hwanggumbol Station. We weren’t allowed to purchase anything or take photos. It looked just like the cheap Chinese trinket stalls found beyond North Korea, even selling tasteless glitzy mobile covers, specifically for the Chinese ZTE line of phones (e.g. ZTE V880) and also the Panasonic T21 and T45 models. The fact they were referred to by their true product names and not rebrands really surprised me. Knock-off sunglasses, fragrances, purses, and even earphones were for sale, as were plastic water pistols, rubber ducks, and bubble blowers. Amongst the plush toys was Mickey Mouse, romantic bears with ‘Angel’ and ‘Baby’ in English stitched to each foot, and a balloon even had Disney’s Snow White on it. Fascinating. And finally, walking out of Chonsung Station, to fireworks and flowers, spotlights and smiles, you as the reader have now reached the end of the line, the end of this gallery, at least. 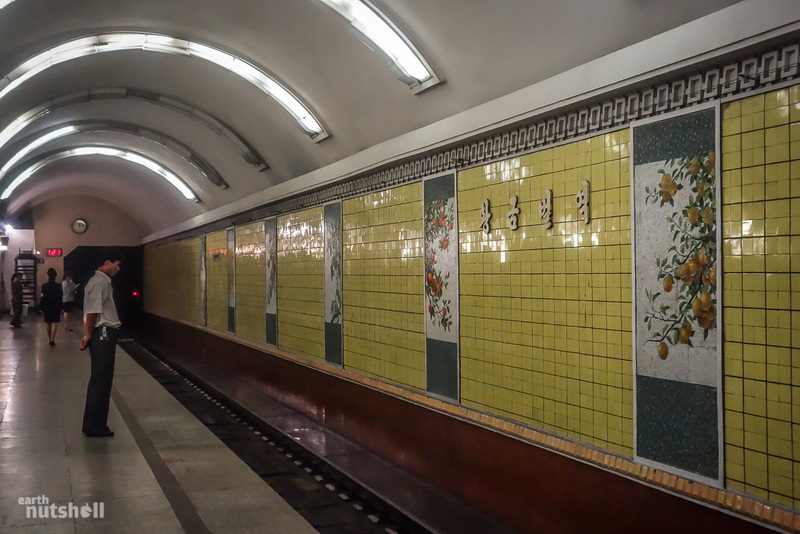 We visited every station today, and as someone without an exact fetish for trains or historic tube systems, I felt enthralled by the ride, another porthole into North Korea, and I hope you did too. 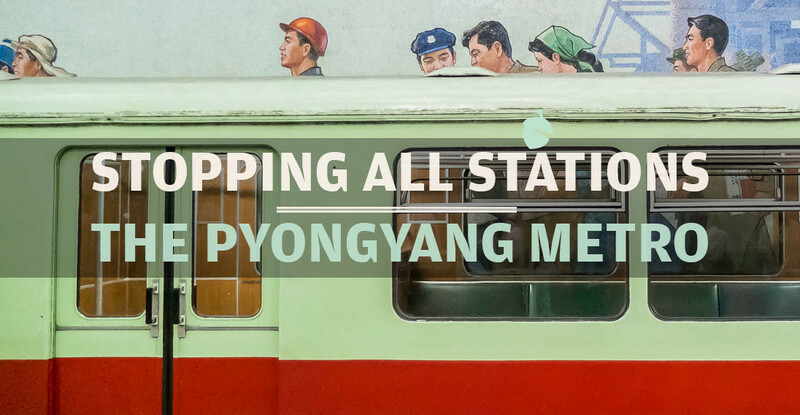 Thanks for joining me for a closer look at the elusive Pyongyang Metro system! 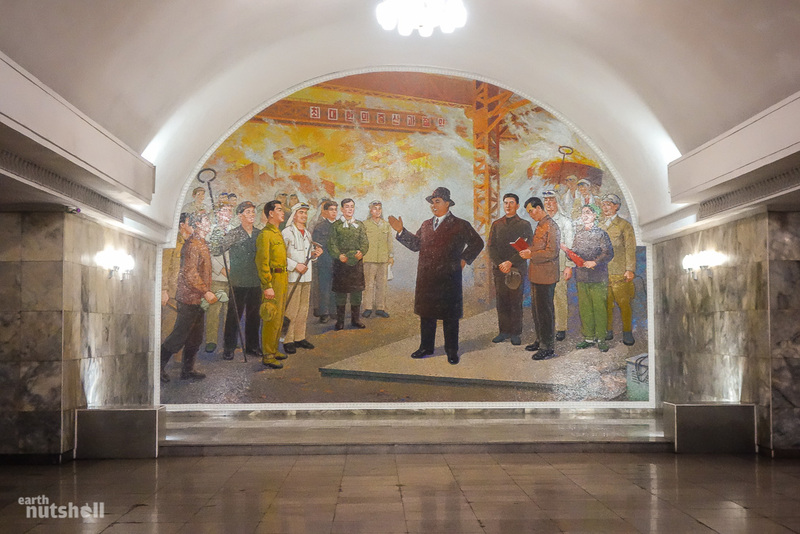 This scene is neither from the Pyongyang Metro or merely another mural. In fact, it’s not a mural at all. 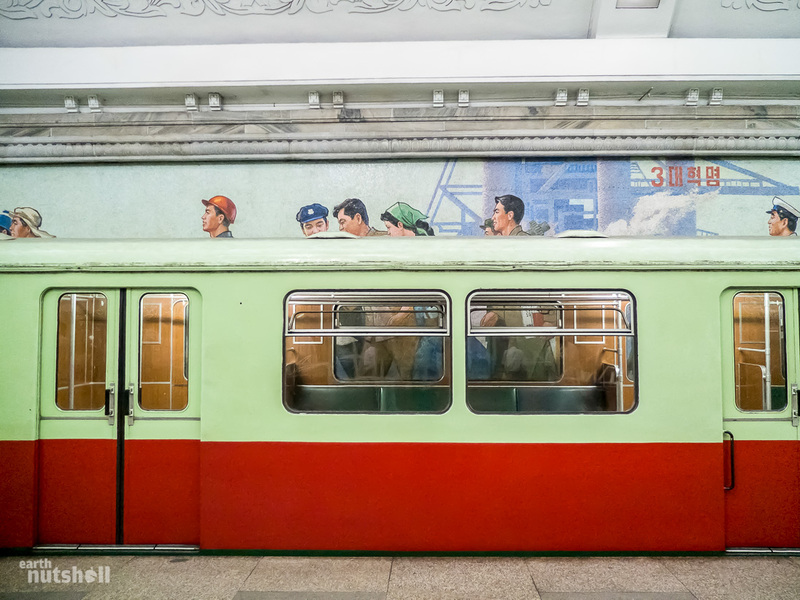 This is a large-scale diorama, a full 360 degrees of three-dimensional objects and flat artworks that combine to put you right into the action of the President Kim Il-Sung-led construction of the Pyongyang Metro back in 1973. 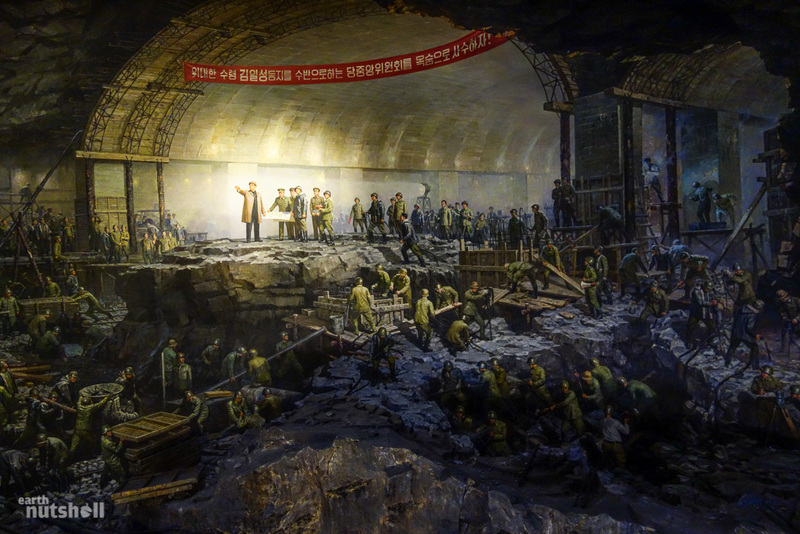 It gets weirder, this diorama exists in the ‘Revolutionary Museum of Metro Construction’, an entire museum in Pyongyang dedicated purely to the opening of the Pyongyang Metro. 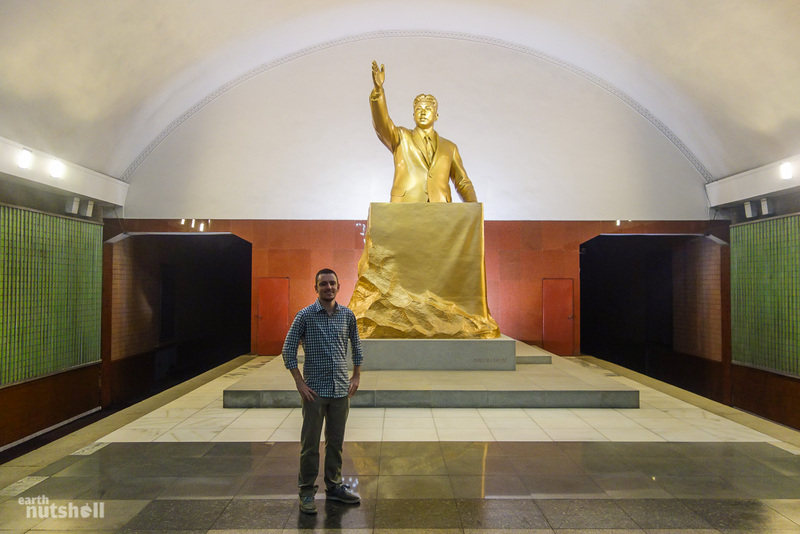 It’s an overall shrine to President Kim Il-Sung’s leadership. 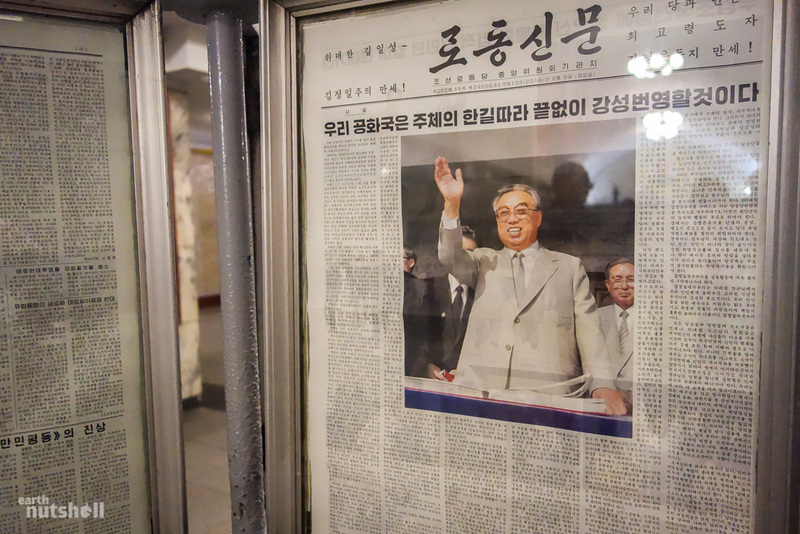 Inside, there are glass-encased exhibits containing the chair President Kim Il-Sung sat in while inspecting construction, the pen he used to sign papers, a microphone he spoke into, a reconstruction of the escalators and even a walk-through recreation of an entire tunnel section. 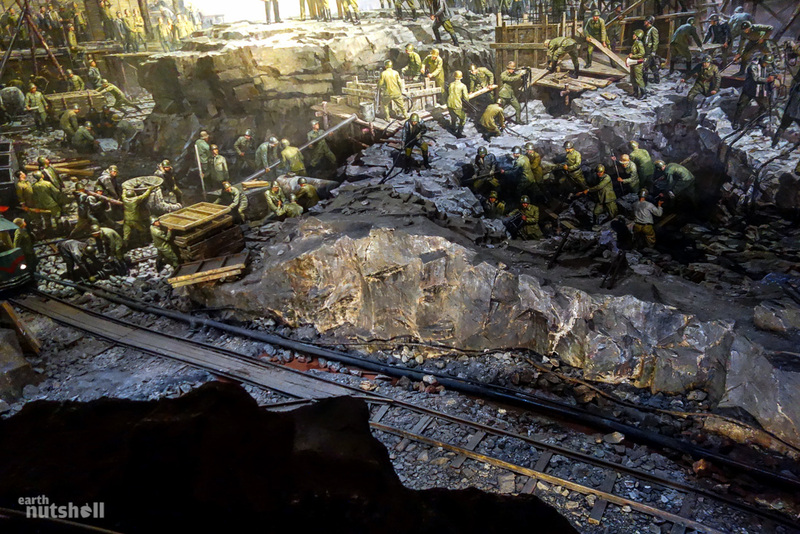 Here you can see clearer the ground, train tracks, and rock face are physical which lead into the rest of the scene to create the overall illusion. The Revolutionary Museum of Metro Construction was an architectural showpiece in itself, multiple levels of open space rooms where the walls and floor were made from the finest granite and marble. 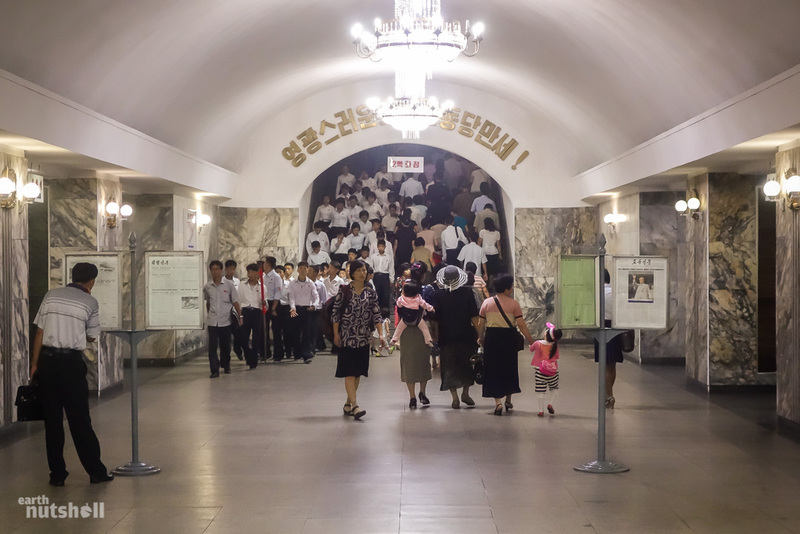 Each room was manned by North Korean guides in traditional Hanbok keen to assist in our Pyongyang Metro education. 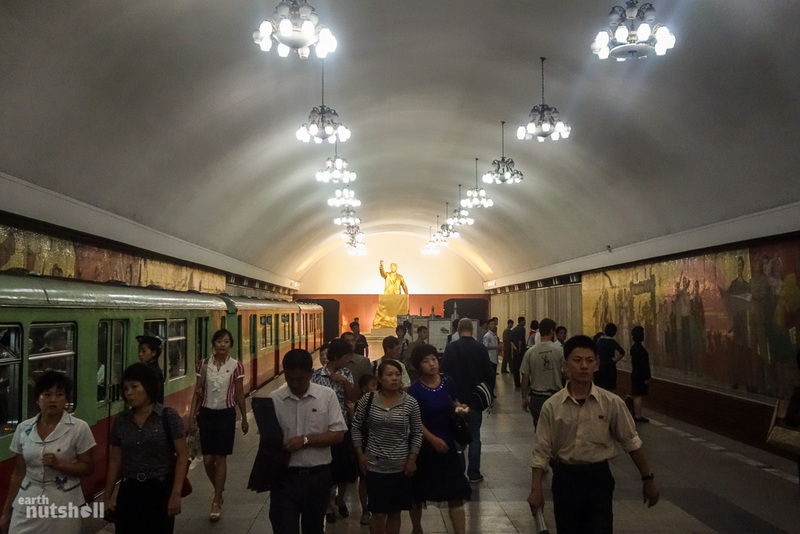 To say North Korea is proud of the Pyongyang Metro is an understatement. I randomly came across your site via Google images and am so fascinated with your photos and commentary. Thanks for these posts, I’m just in awe where you got to go and what you were able to see. Same layouts designs and aesthetics.